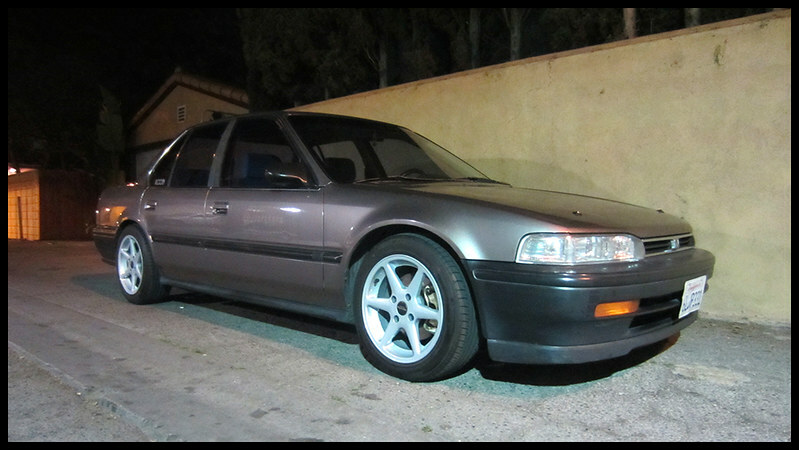 Here's my CB7 as it sits currently! I'm going to tell this one in rewind, so it ends in the beginning! 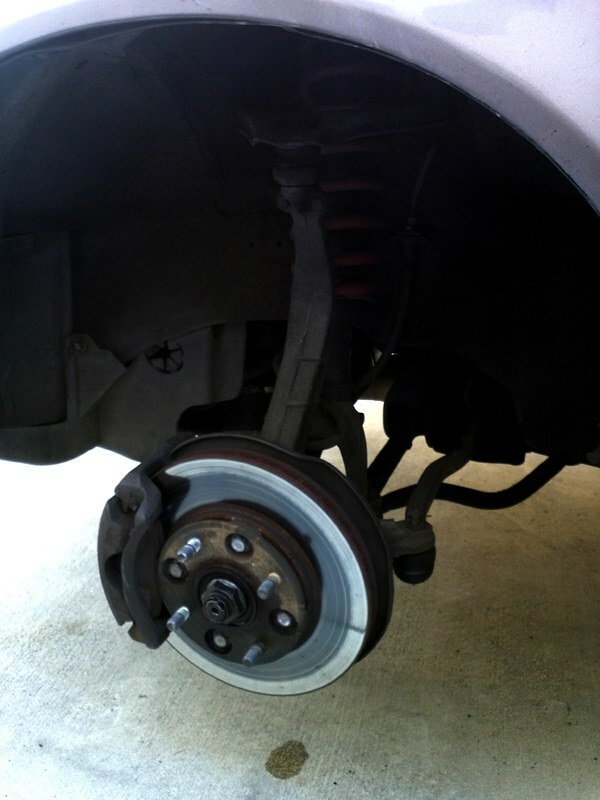 April 21, 2016 - Brake Upgrade. Post 89. March 2, 2016 - Red/Clear Tail Lights. Post 67. 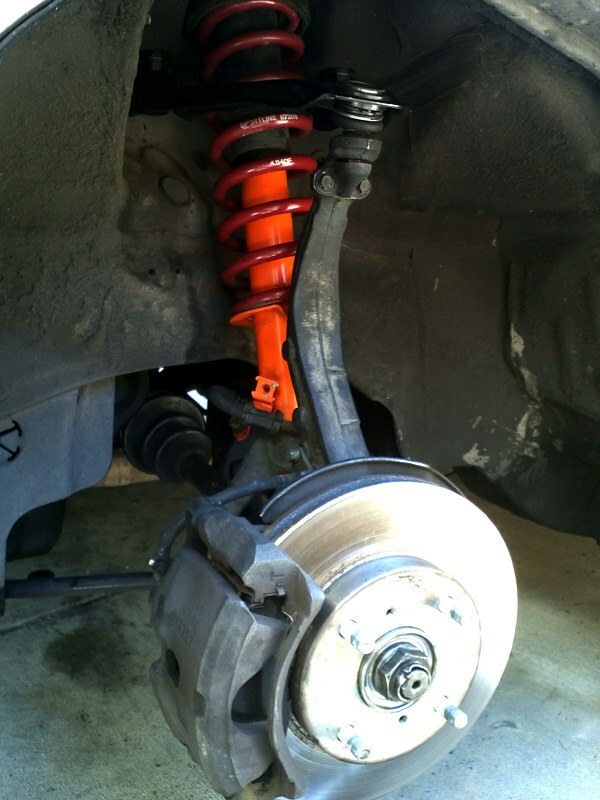 February 2016 - Coilovers! Post 48. 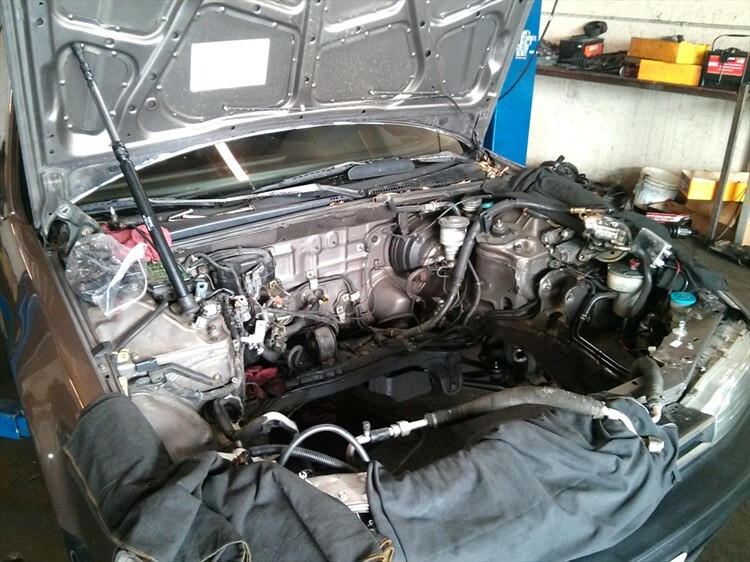 February 2016 - Power Steering Delete: post 42. 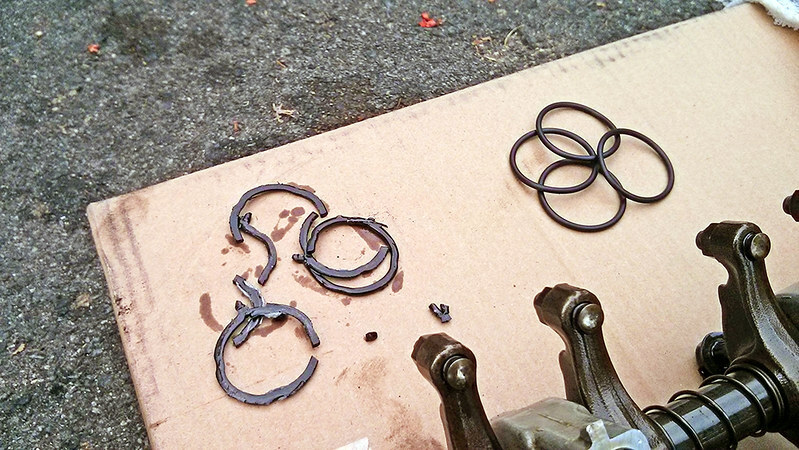 February 2016 - Russell stainless steel braided AN fuel line: post 33. 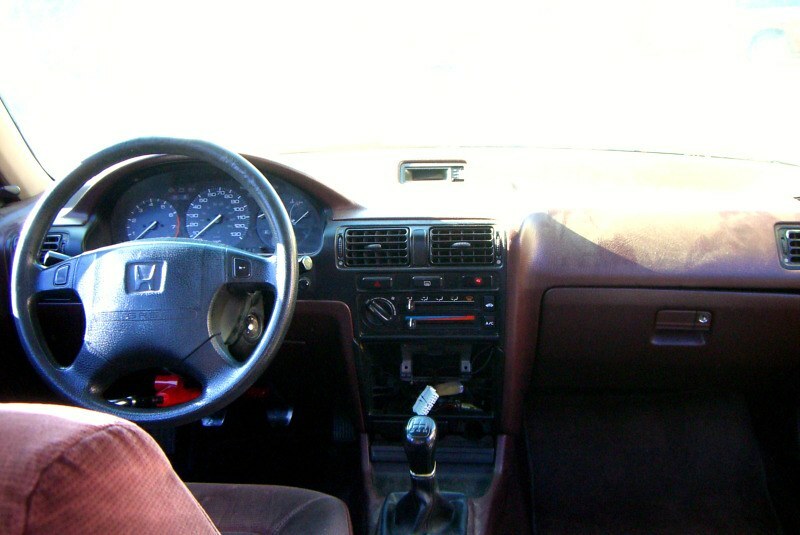 January 2016 - Nardi Personal Blitz steering wheel and shifter modification: post 31. 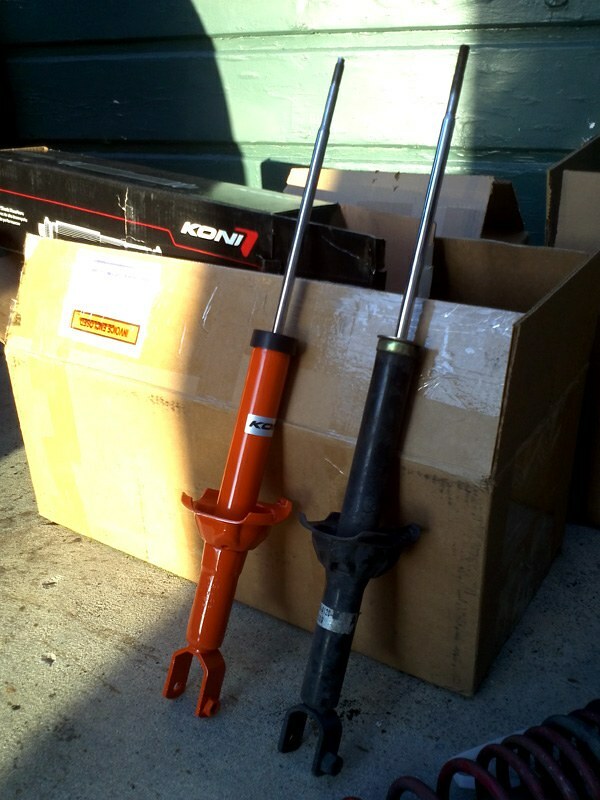 January 2016 - Shifter Upgrade: post 22. 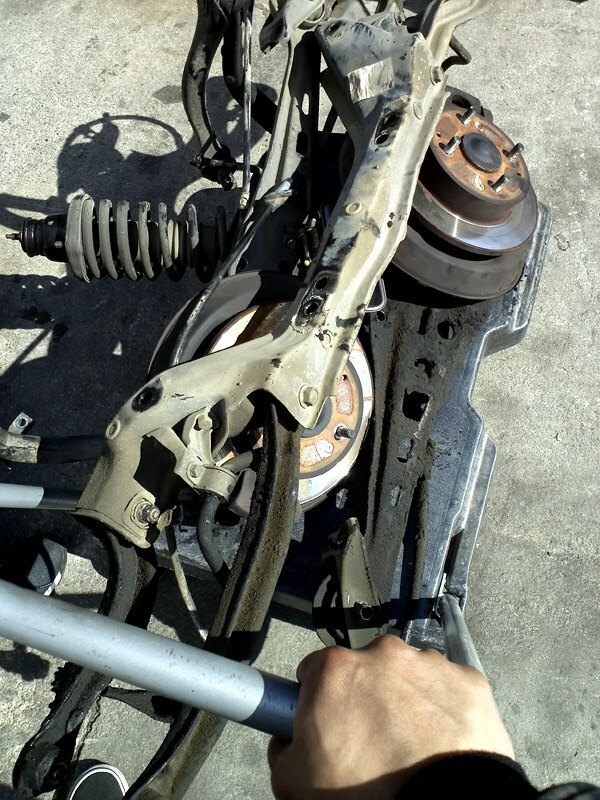 September 2015 - Repair & Maintenance: post 18. September 2015 - Discovered there's a max image per post. 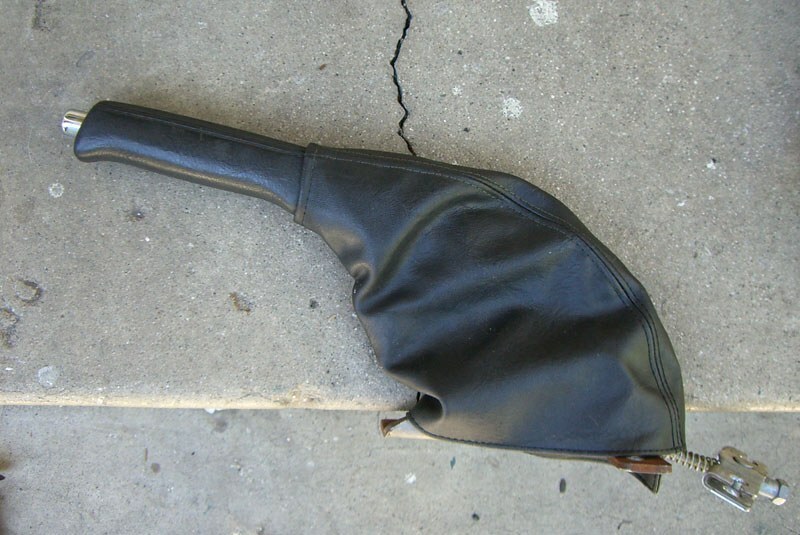 Minor aesthetic repairs: post 14. 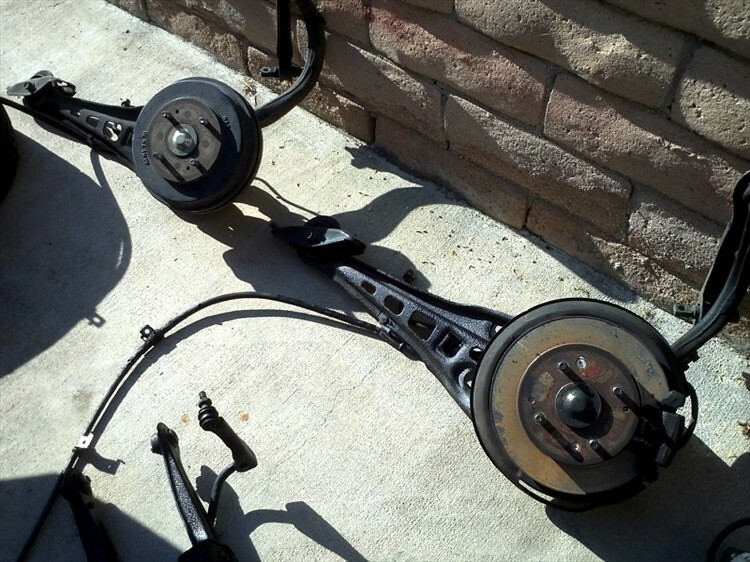 August 2015 - Installed Energy Suspension Master Bushing Kit, Front Engine Mount Inserts, SPC Adjustable Upper Ball Joints, new axles and rear shims for camber adjustment. 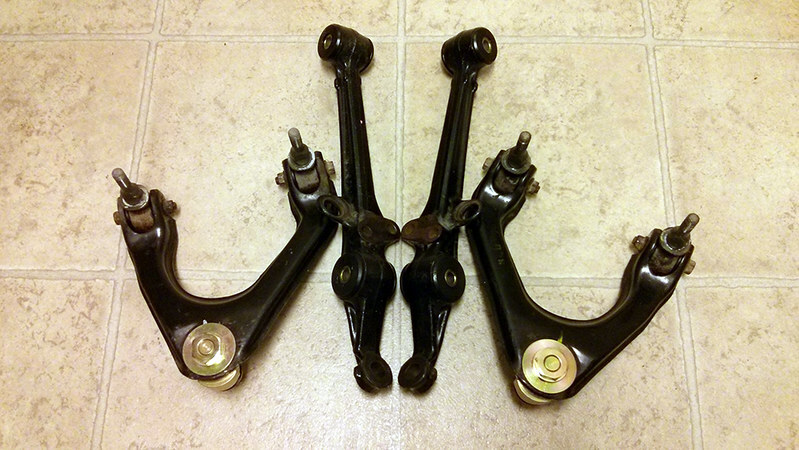 Got the arms from the yard and had a truck suspension shop push all the old bushings out. 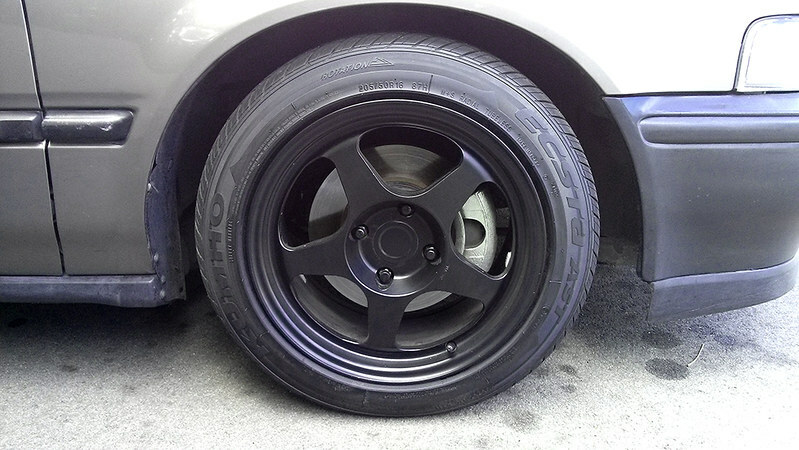 July 2015 - Found someone selling a hard to find set of black Rota Slipstreams in 16x8 with +40 offset. Had to cop them! Did the conduit cap mod for the center cap with satin black Rustoleum paint! 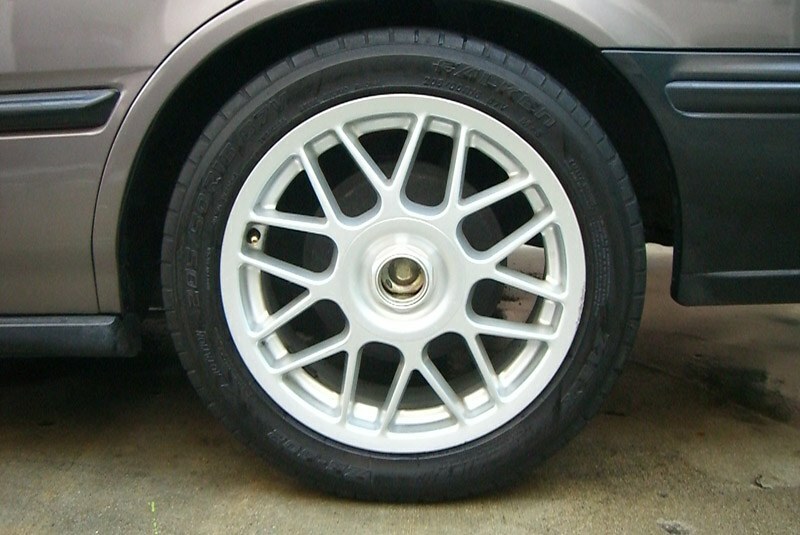 I was running Kumho Ecsta AST's at the time on the previous wheels. October 2014 - Blacked out the headlights when I installed a Morimoto Mini D2S kit. 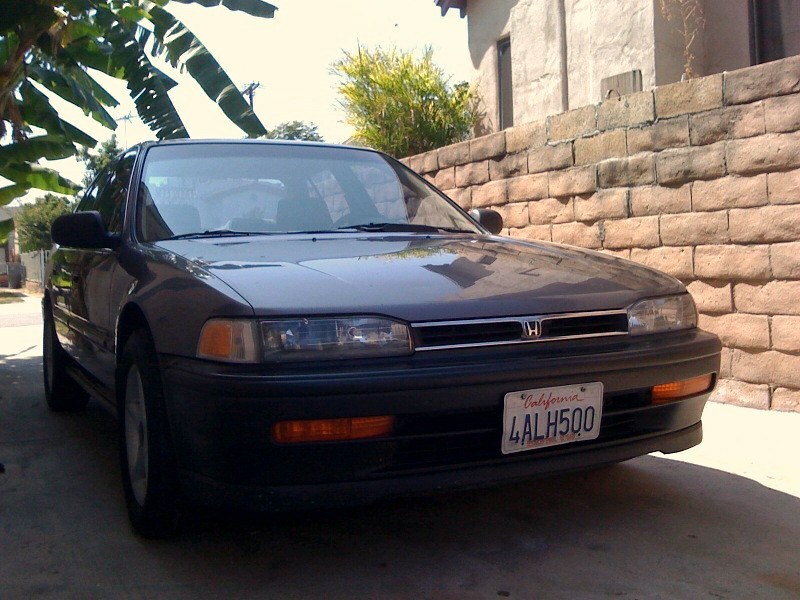 Also installed a G-Square style front grille. Lost those photos. 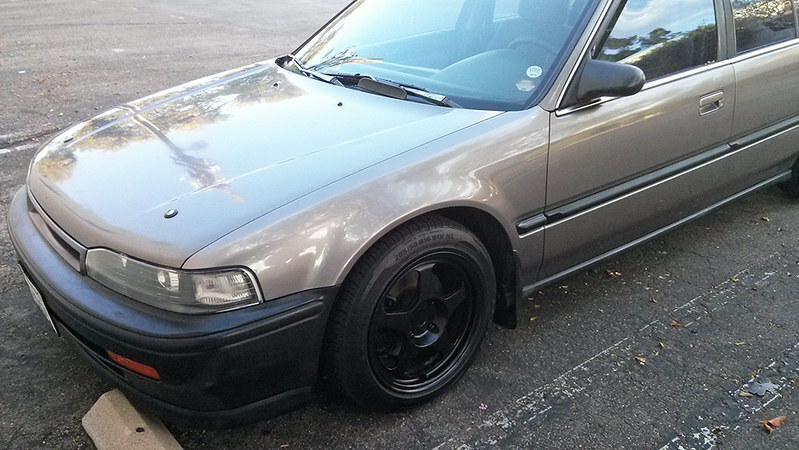 February 2014 - Picked up a set of Motoring Exponents 16x75 +35 wheels (Borbet Type-C replicas). 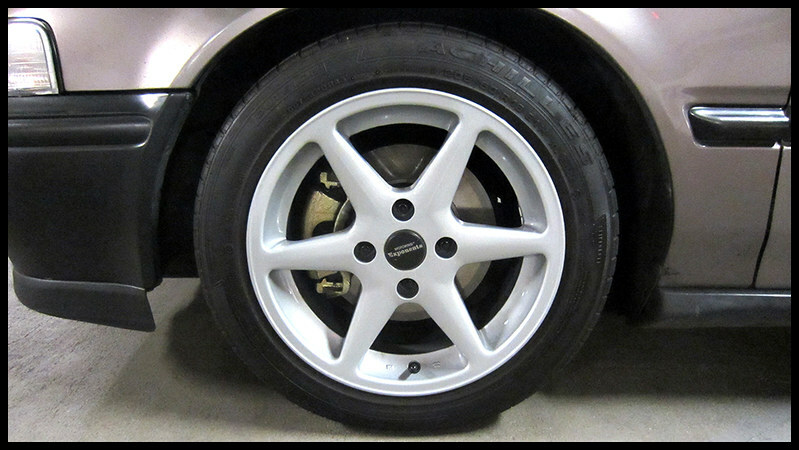 They were white, but I had them stripped and refinished in the OEM style silver. They were on Achilles 2233's, which were decent tires, but had a hell of a time balancing. 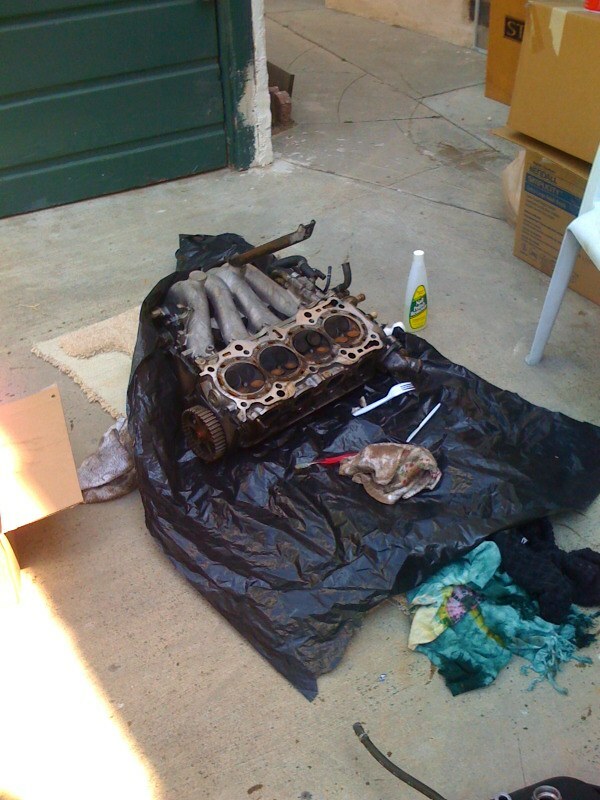 November 2013 - Oil pump seized and made a mess of everything. Found a local shop that would rebuild and install another F22A for me. Drove it up leaking oil everywhere. May as well since I was having it swapped out. 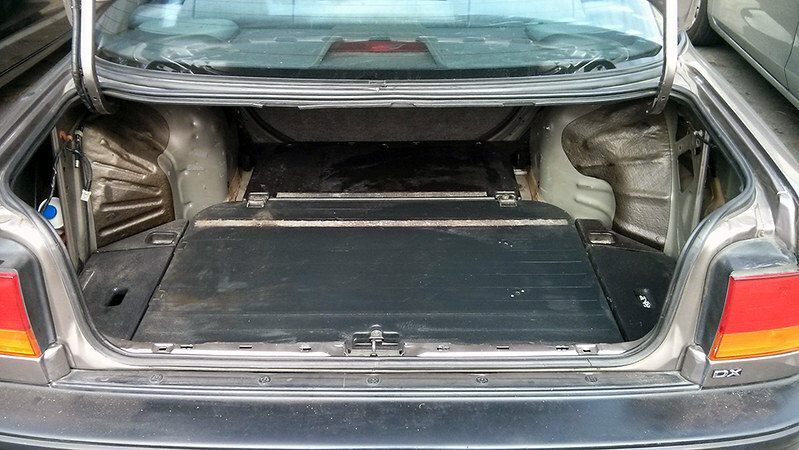 October 2013 - Someone stole my battery. Fortunately that's all. Installed Spectre hood locks. 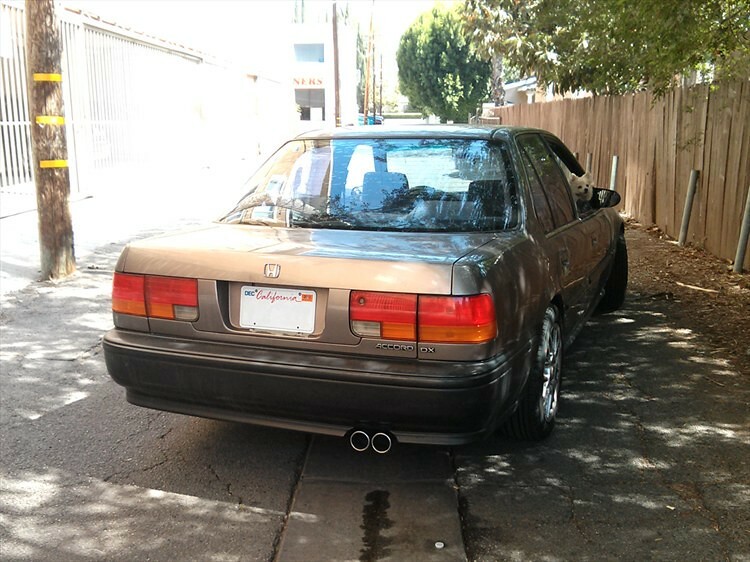 September 2013 - Found a guy selling a Sebring axle back for a Prelude. 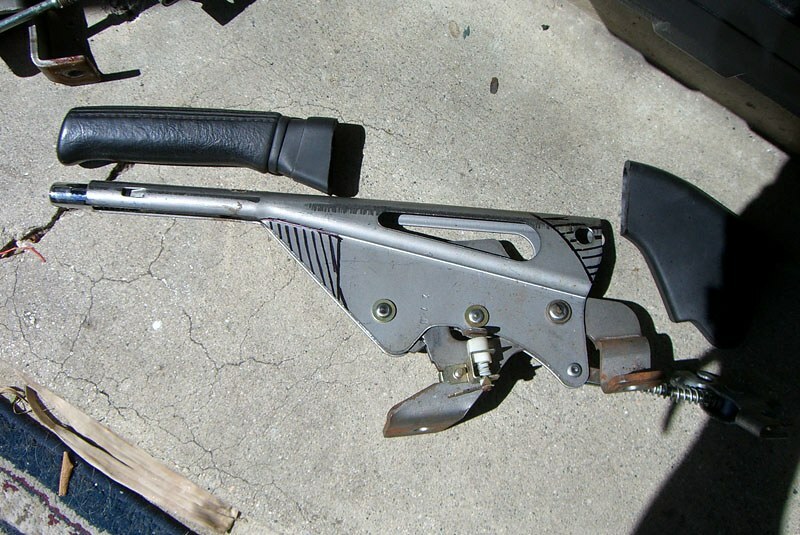 Had it custom welded to the stock piping. 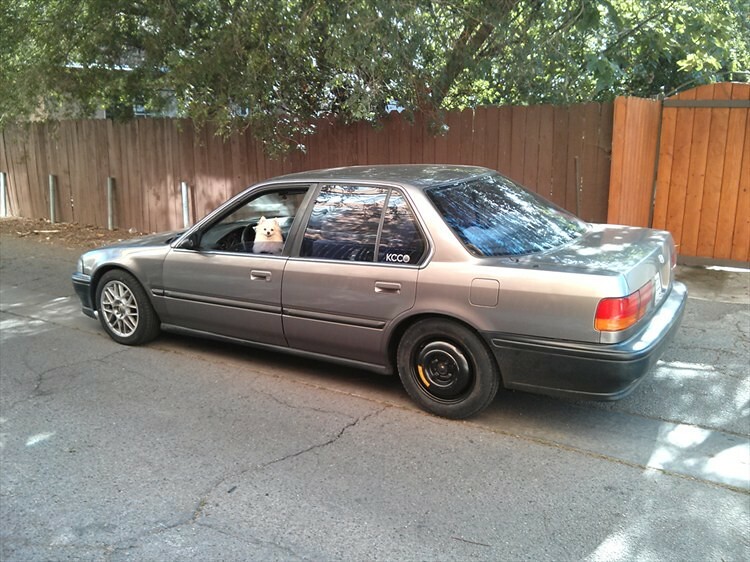 Also dented a wheel that month, had to ride on a donut. May 2012 - Big overhaul! 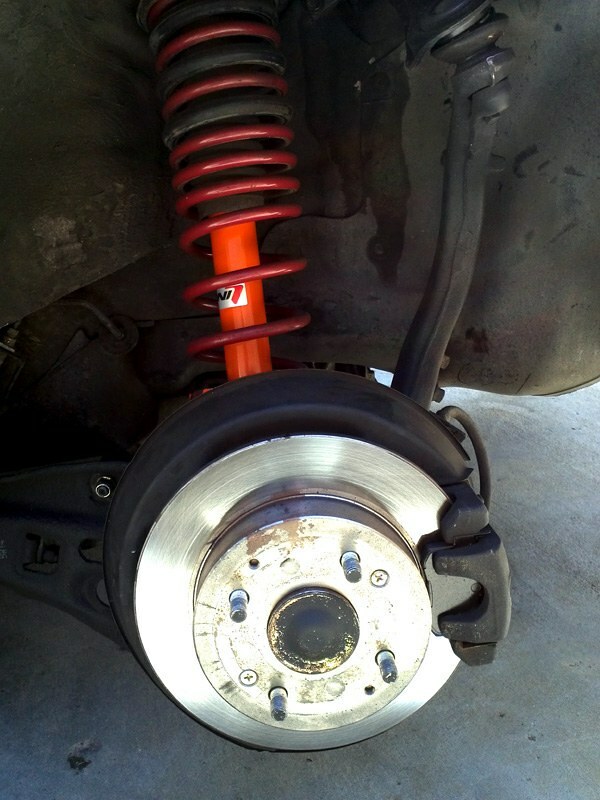 11" ROH conversion, rear disc brake conversion and Koni STR-T struts. 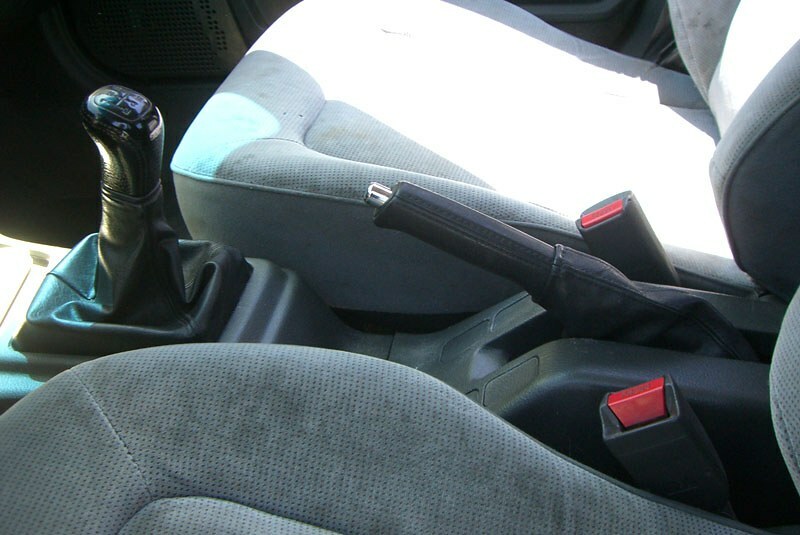 Also made a Prelude hand brake work (not knowing the Vigor one worked). 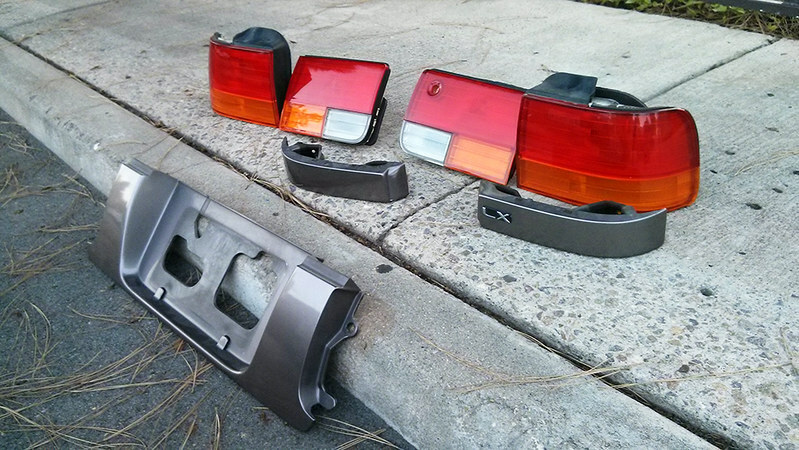 July 2011 - One piece JDM headlights and DIY Spoon Style mirrors. Mounted the mirrors using base plates for M3 Style mirrors. 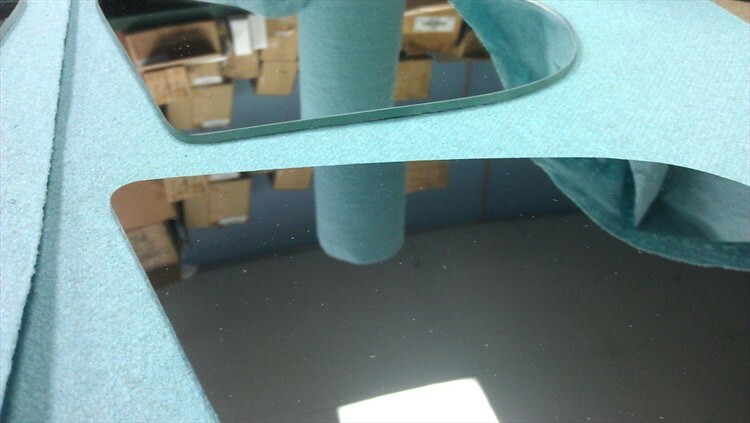 Cut mirror glass from larger SUV mirror glass replacements. 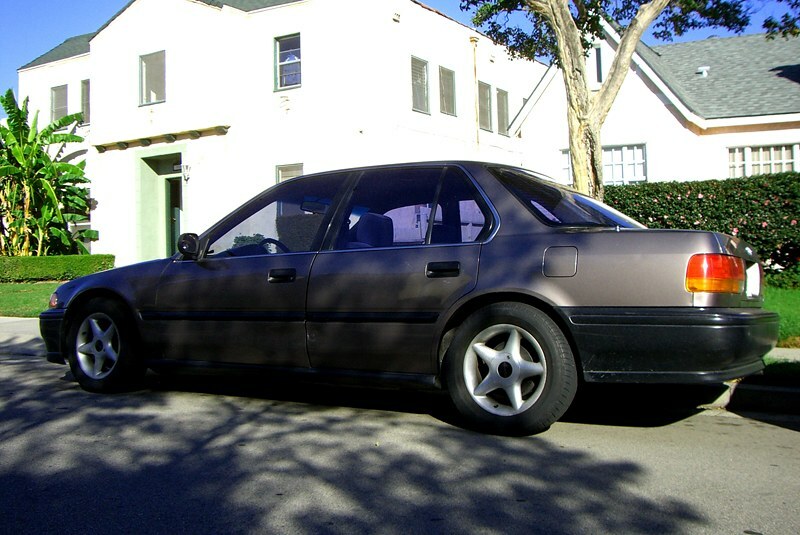 June 2011 - Found a 1993 Accord in the same Rosewood Brown Metallic at the yard. 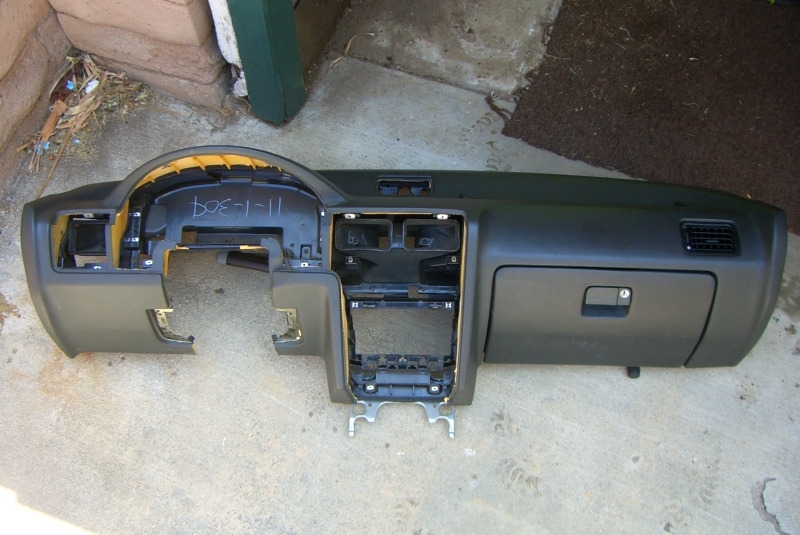 Picked the driver's side doors and all of the door handles off of it. 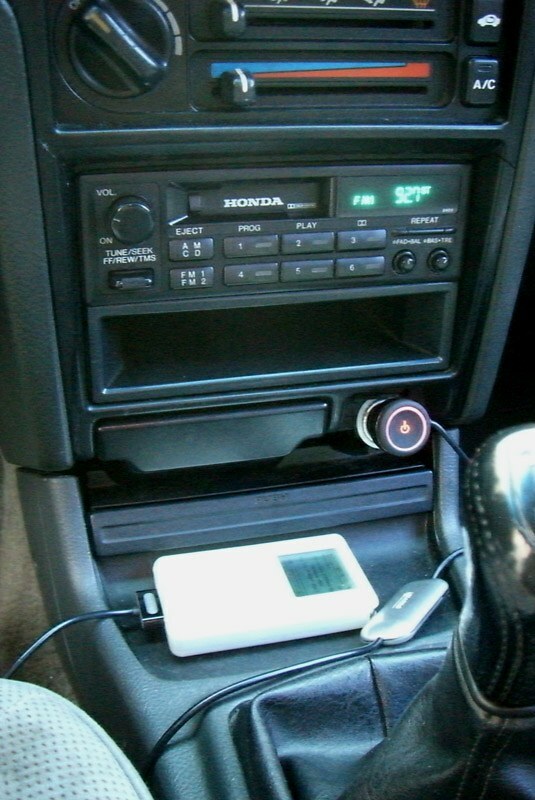 March 2011 - Picked up a 1994 Accord head unit and four Kenwood 5.6 coaxial speakers at the yard. Using my iTrip with an old school iPod for my music. 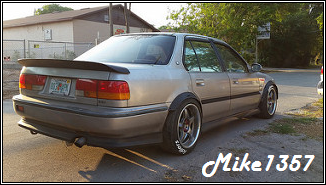 February 2011 - Found some ASA EM9 16x7 +35 wheels with Falken Ziex ZE-502's. 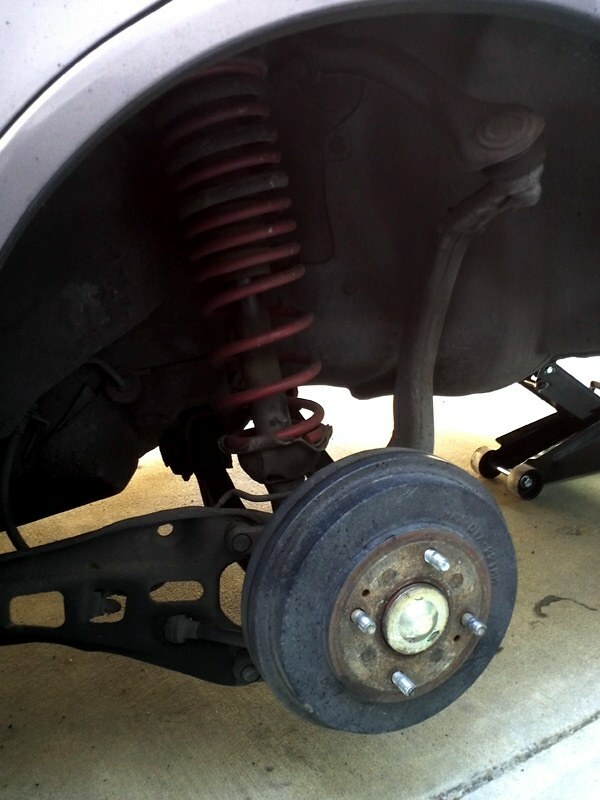 October 2010 - Used Eibach Sportline Springs. 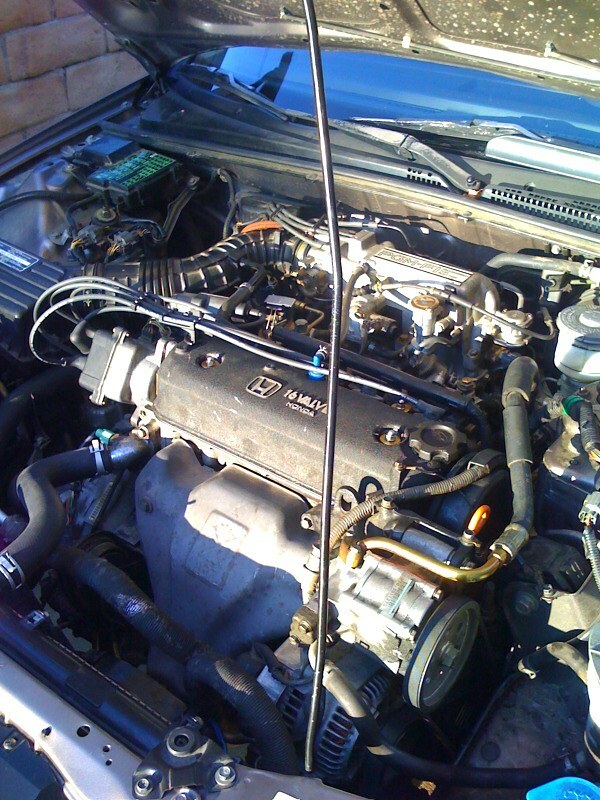 September 2010 - Dug up my old Tanabe Sustec front upper strut bar that I had from my 97 Accord back in the day. 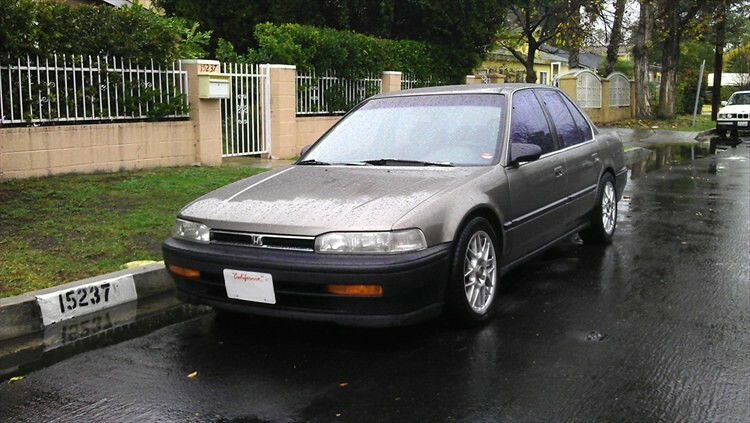 August 2010 - 94-95 Accord front lip. 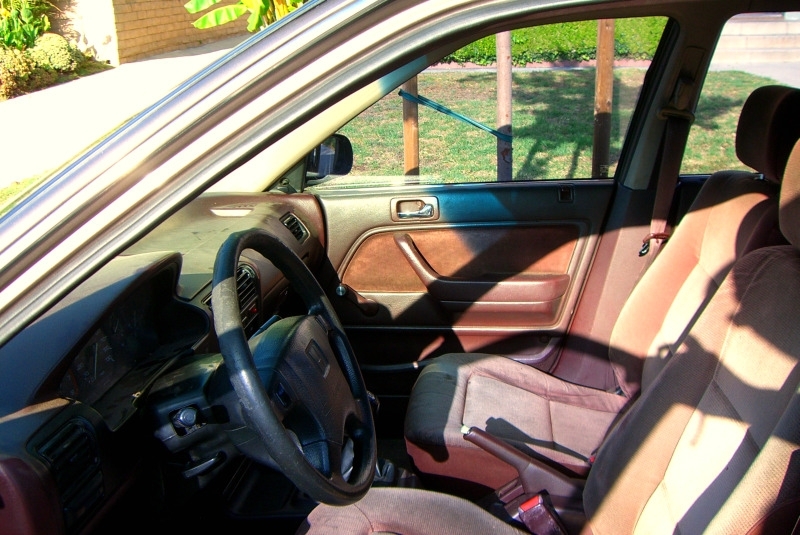 Complete Gray DX interior from a part out. 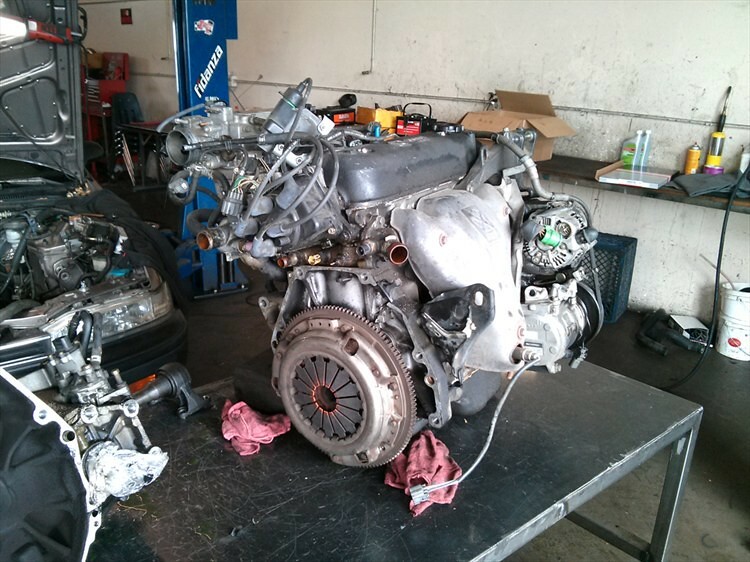 July 2010 (The Beginning) - Picked up this CB7 with 241,000 on the clock, a blown head gasket and no head unit or speakers. Mean little sideswipe action on the drivers side doors, too. 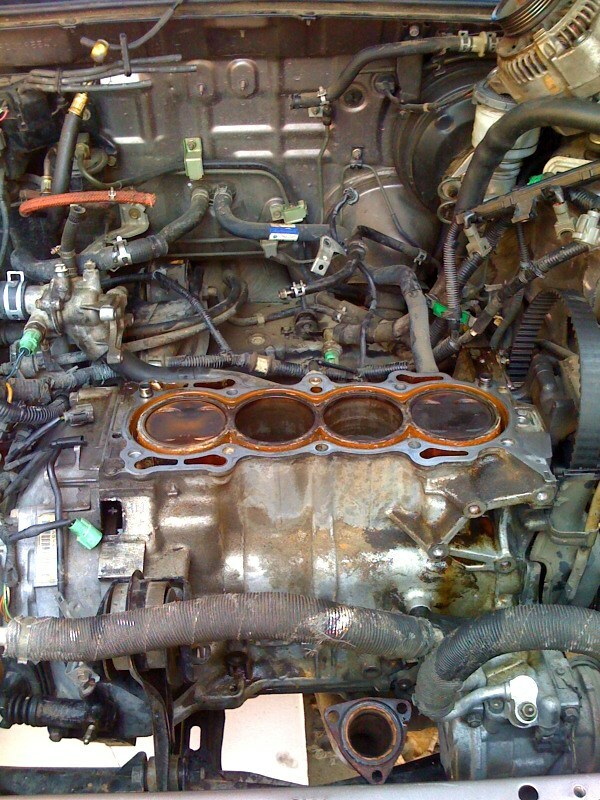 Pulled the head, did a lot of clean up, put in the new gasket and got it back on the road. Last edited by apalileo; 07-25-2017 at 06:43 PM. I thoroughly enjoyed reading that. 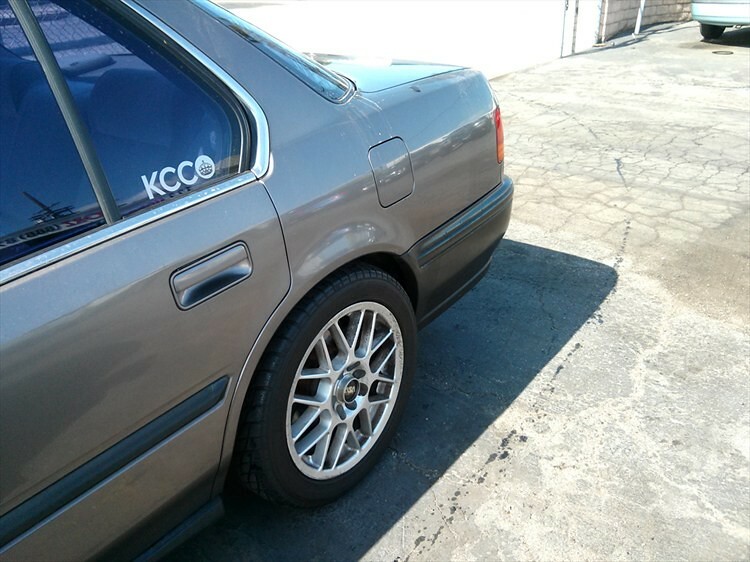 You've made a really awesome car by just doing small, tasteful upgrades over the life of it. 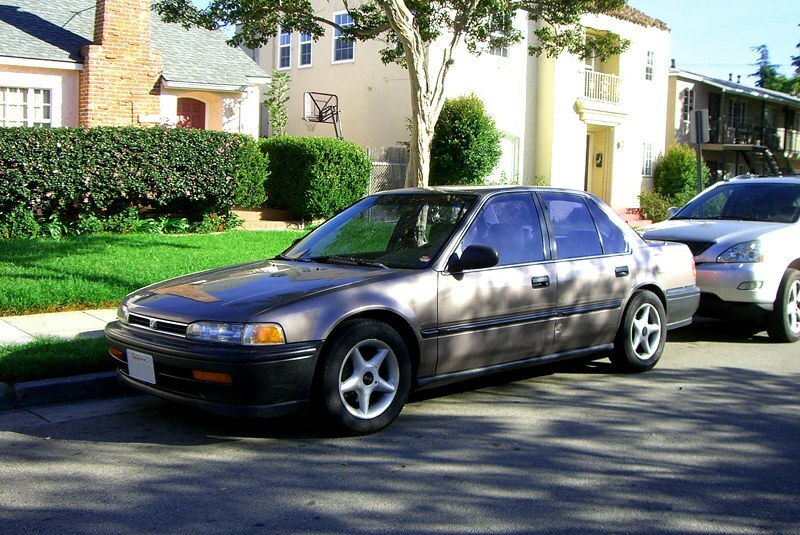 It looks very clean and simple, like Honda should have offered it from the factory. The only bad part about reading threads like this is that so much activity is condensed into one post. Then when we come back to check things out again in the future, progress isn't made at the same rate. My own thread is guilty of that. 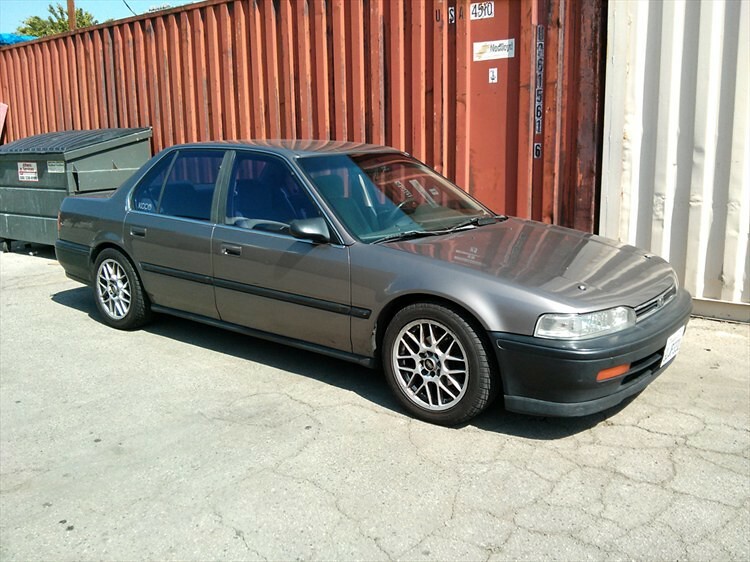 I love what you've done to this accord! 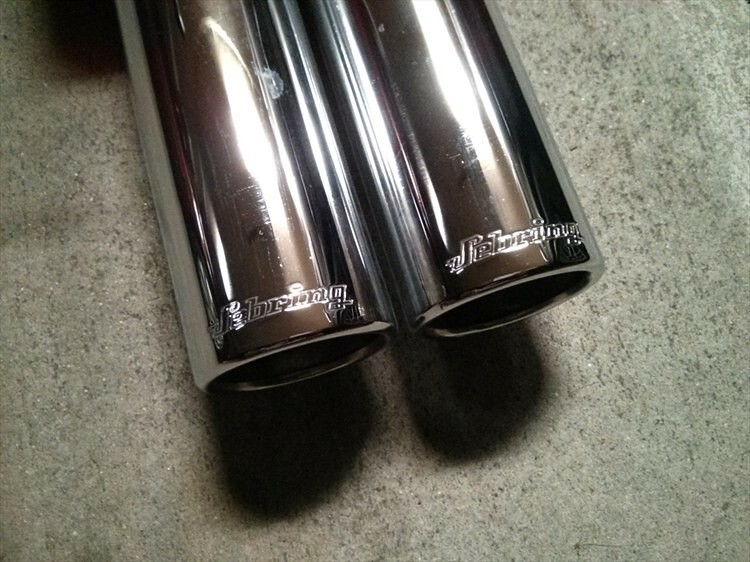 Even being a DX you've treated it very well, and done tasteful mods. Hopefully it just keeps getting better from here. I know how being a lurker is, I lurked for about 5 years myself before posting anything. Always better late than never! @Jarrett Thanks! I always put as much thought and consideration into each of my modifications as possible. Not for anyone else's sake, but for my own satisfaction. With all these pictures I've taken through the years, it was only right that I share my progress with like-minded enthusiasts. I know there'll be gaps in the works, like many other MRT's, but it's always nice to see the steps each and every person takes with their own car. Yours has seen quite a lot of action, despite the weather, too! I respect that! @Rilas Much appreciated! 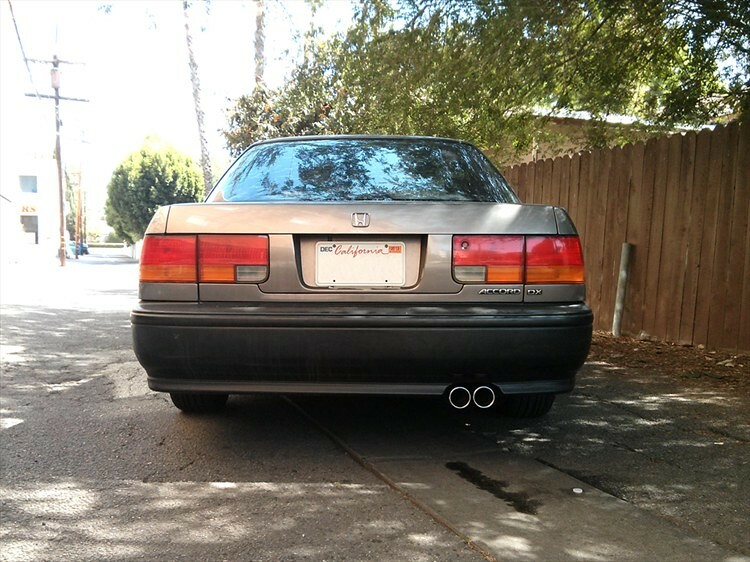 I know I've taken far more from these forums than I've given, and my car is a testament to that. 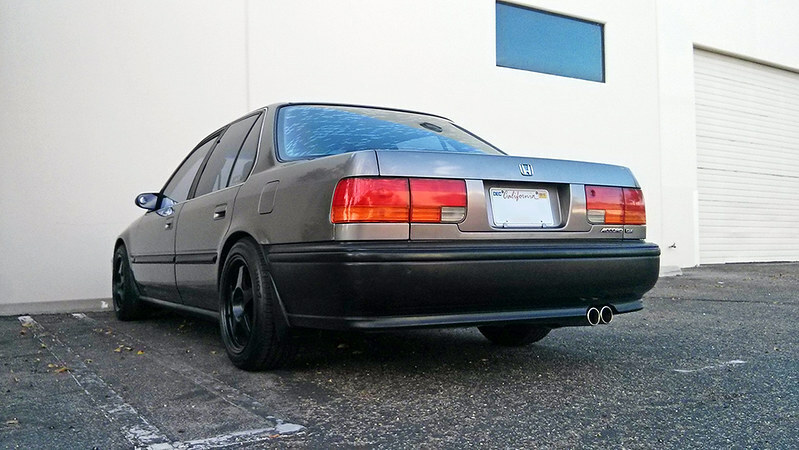 I once had a 97 Accord EX and learned a lot from that, but these forums took that knowledge much farther. With the DIY and tech sections being so informative! I owe a bit of thanks to everyone here for sharing their work and experiences as well. 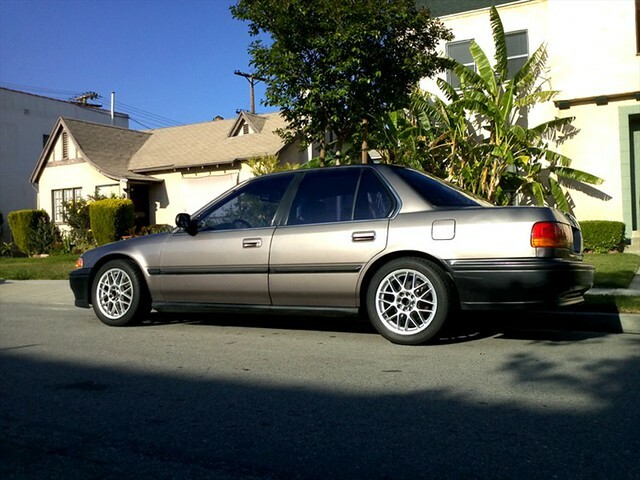 I love your documentation on your coupe! I get too excited to take photos sometimes. 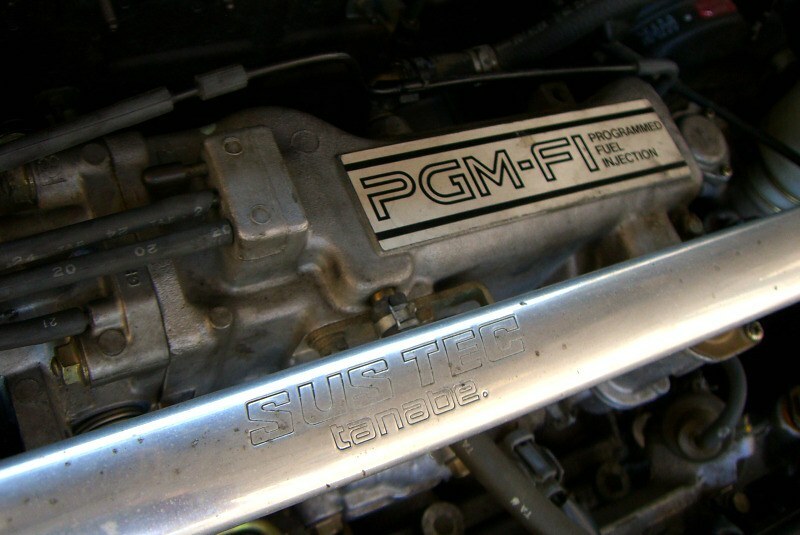 I also like the idea of the F22B swap. It just looks proper! 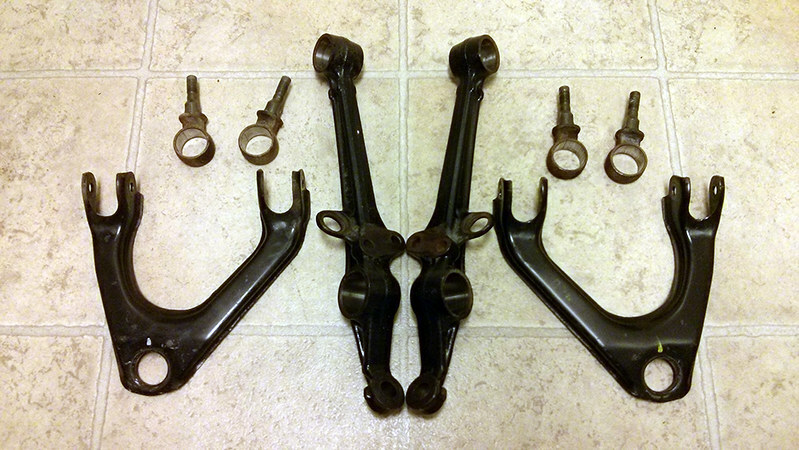 Coming soon will be Techna-Fit brake lines and a 40/40 Prop valve to get the most out of my brake work. 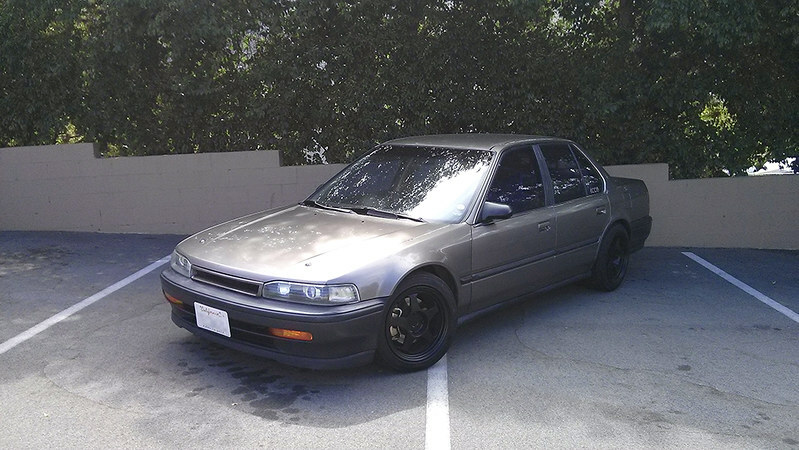 Thanks for the compliment on the coupe. The F22B does look very nice in the bay. 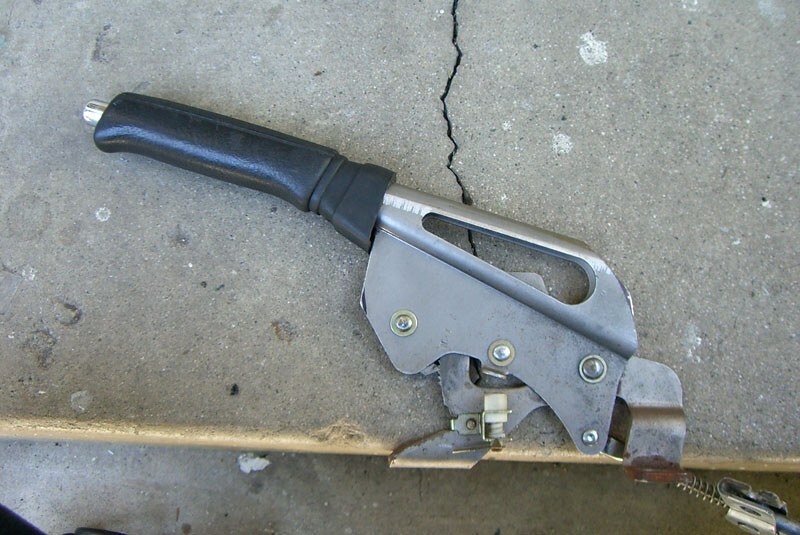 Yesterday I used your DIY from years ago to change my e-brake handle. The Vigor is no different than the Prelude. I had to do all the same exact things to make it work. 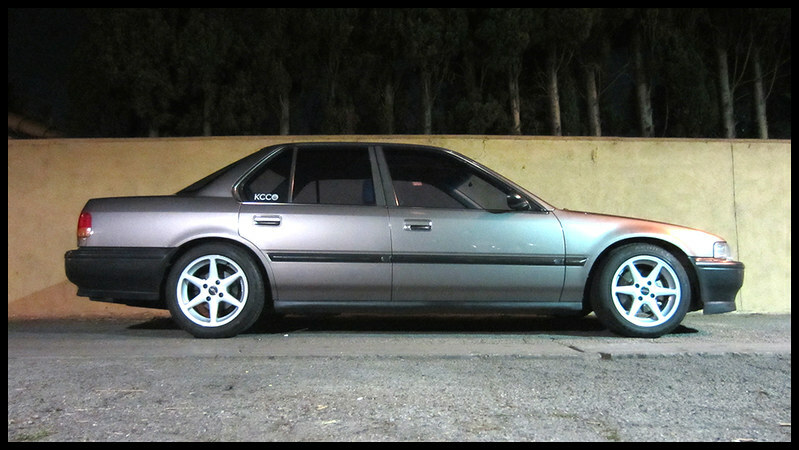 I still love your sedan though, its so clean for it's age. Keep up the good work. Lol @ stealing the battery but not the $300 headlights! 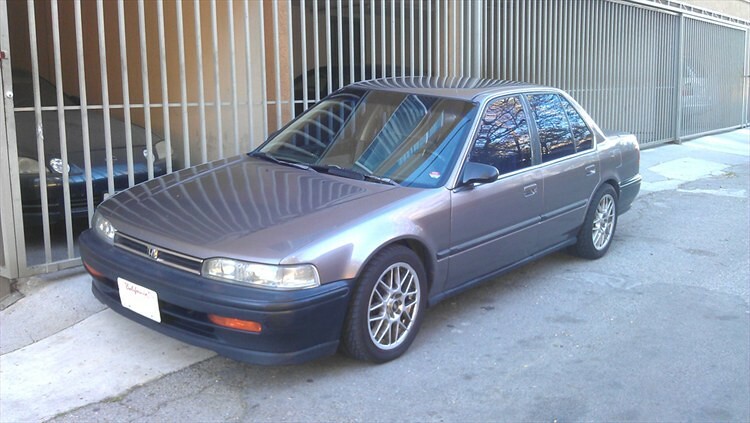 Nicely done sedan though. 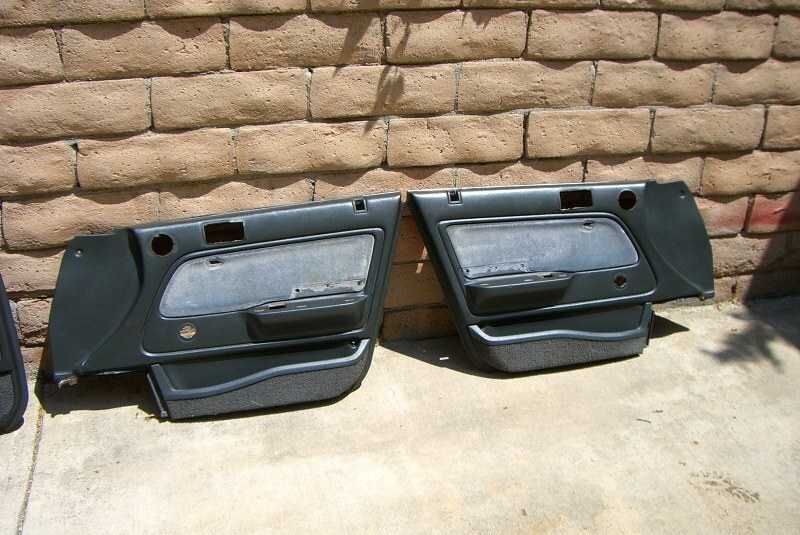 You ever plan on painting the bumpers, or keeping them black? Looks good either way to me, I'm just curious. @Rilas Glad to know my post wasn't in vain then! I remember someone commenting that the Vigor unit was a direct fit. Guess it was worth posting the extra steps! @Cyborg Can you believe that!? 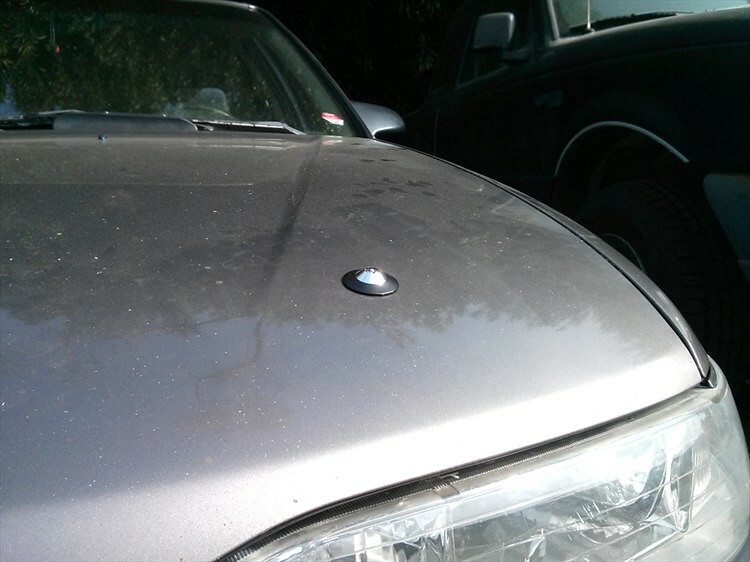 I was leaving for work one morning and saw the hood popped. My heart sank. 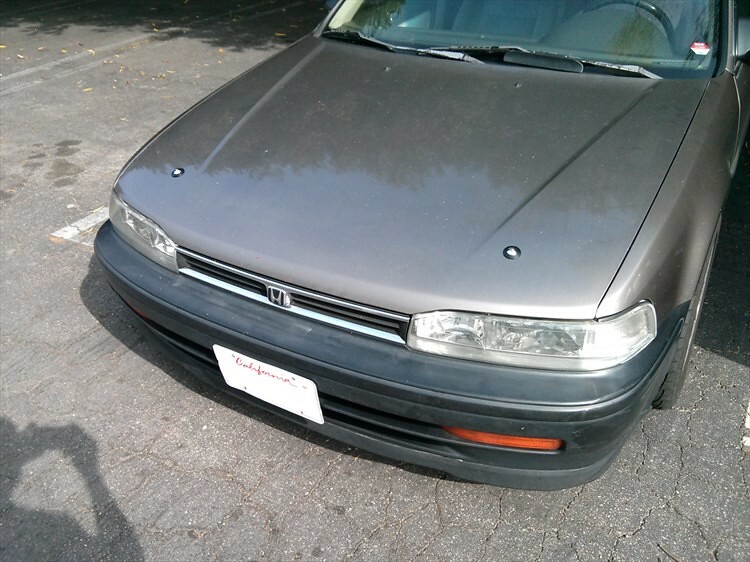 I was glad the headlights were still on, but was afraid the HID kit was stolen or worse! 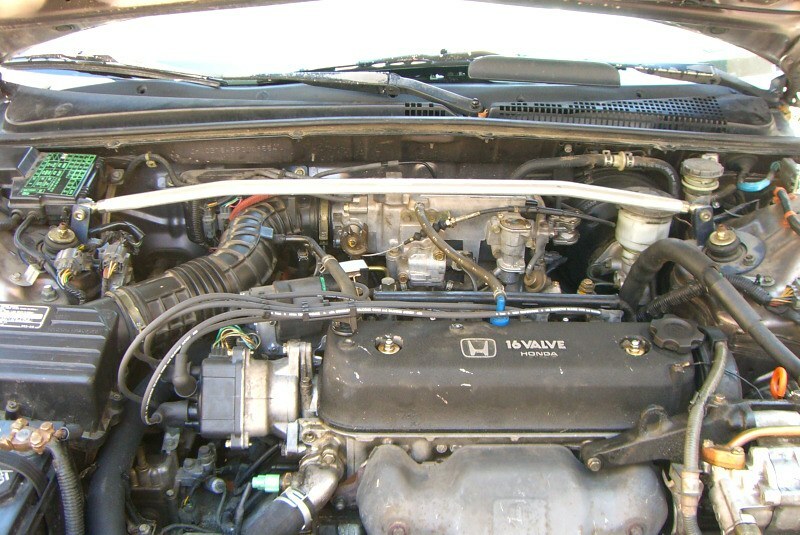 Open the engine bay to find only the battery missing. HOWEVER! 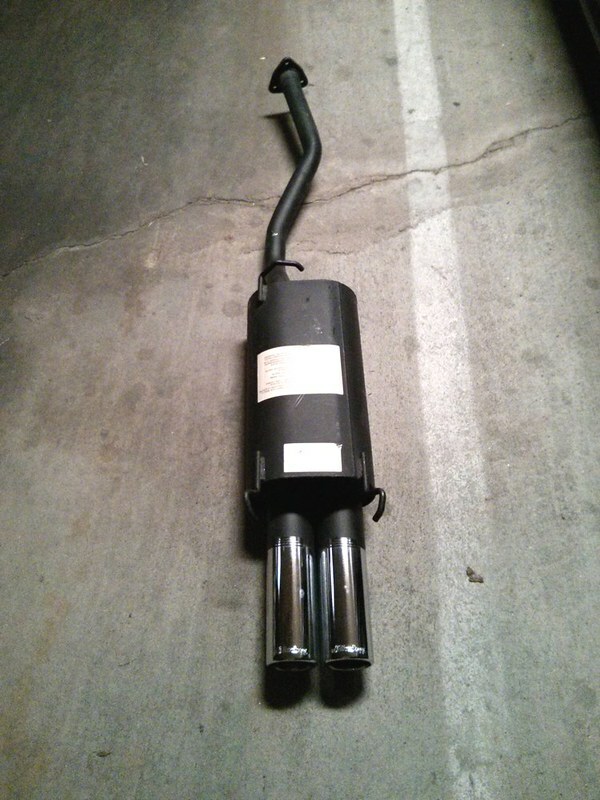 The culprit(s) had politely laid the battery tie down and the tie down hooks and nuts on top of the air box. Nothing was taken from inside the car either. They popped the driver side lock, popped the hood, took the battery and shook. Crazy thing, it was a 7 year old battery. Someone was desperate to get to work that morning! 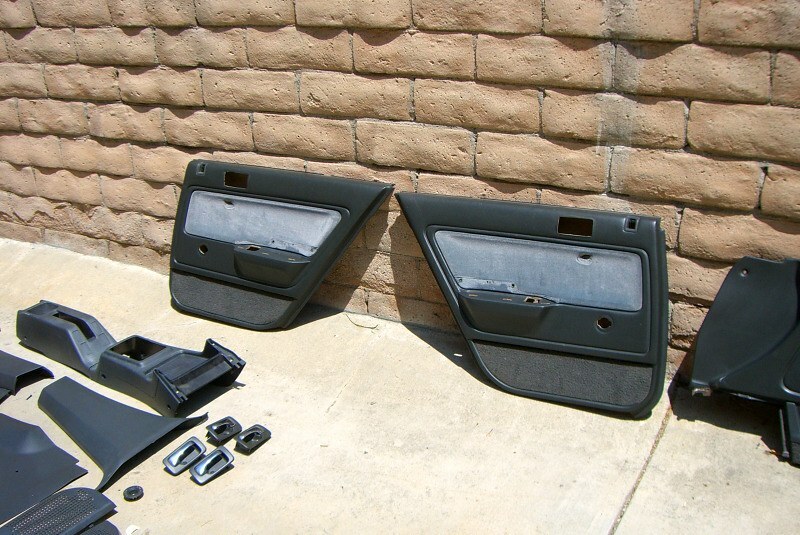 As for the bumpers, I intend on leaving them black. 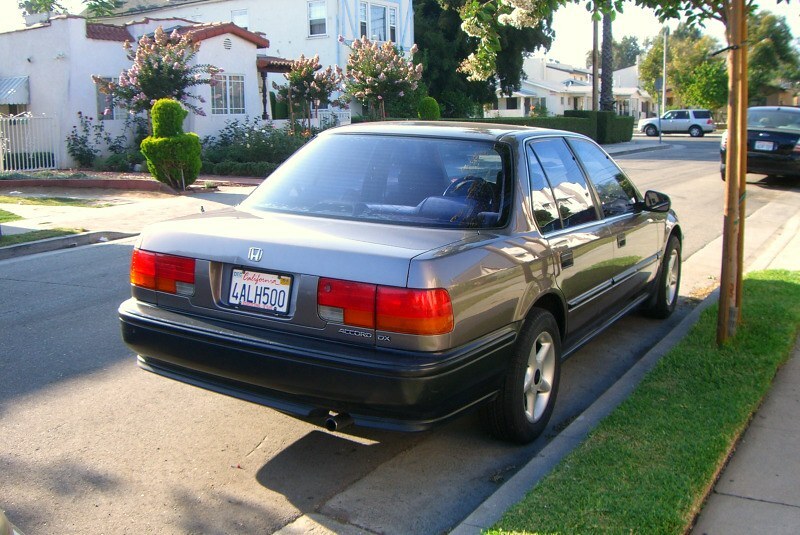 Body matched bumpers were an LX and EX feature. I like the charm of my DX. My friends are always amused by the manual windows and locks. I bust everyone's balls about locking their doors as they get out. 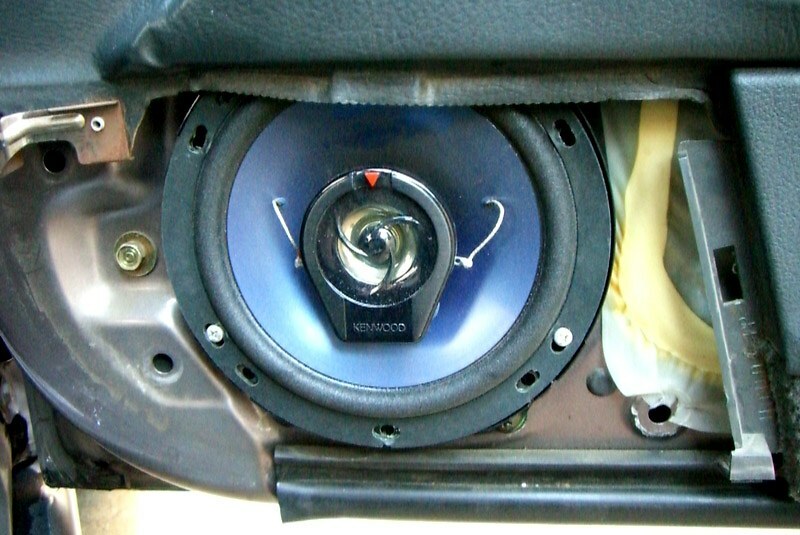 Small upgrades like rear speakers and the door handles were more for their function than anything. 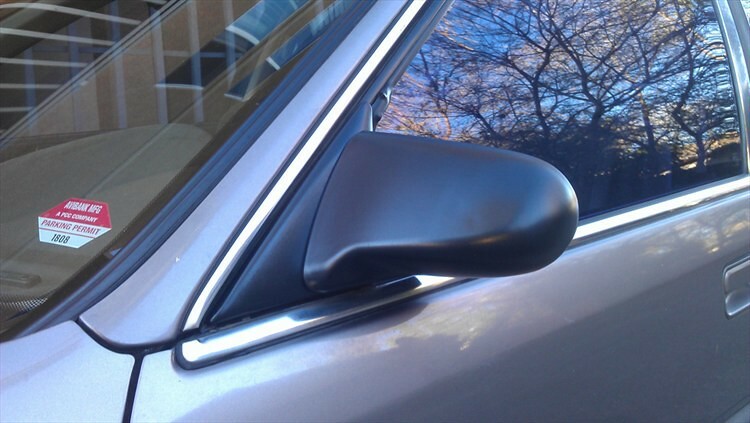 The DX door handles, if you've ever opened a door with one, are pure plastic and feel "cheap". 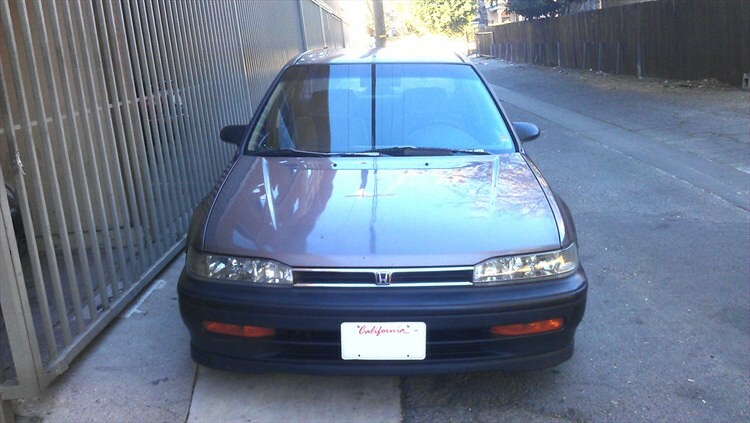 I wanted the heavier, sturdier LX/EX door handles, but came across a matching Rosewood Accord before I found a black one with all of the door handles still in tact. I was actually looking for black, but would always find the fronts missing from all of the ones in the yard. 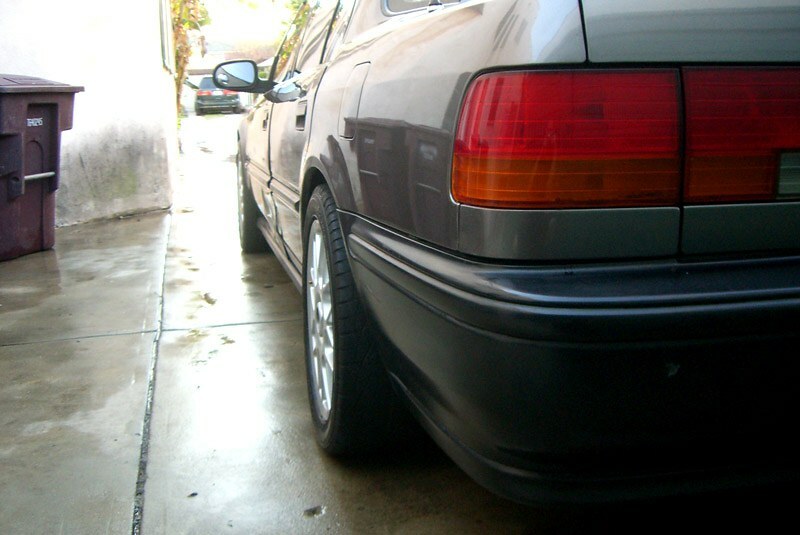 I thought about trying all rear door handles, but then I'd have no way to get into the car (without modification)! 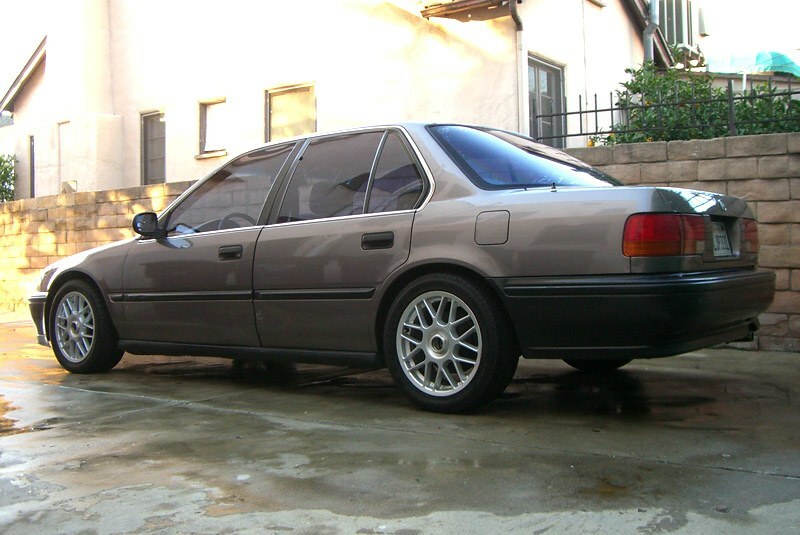 Super clean DX! is the paint original? If so hot damn thats one of the cleanest I have ever seen. @baracuda Thank you kindly! 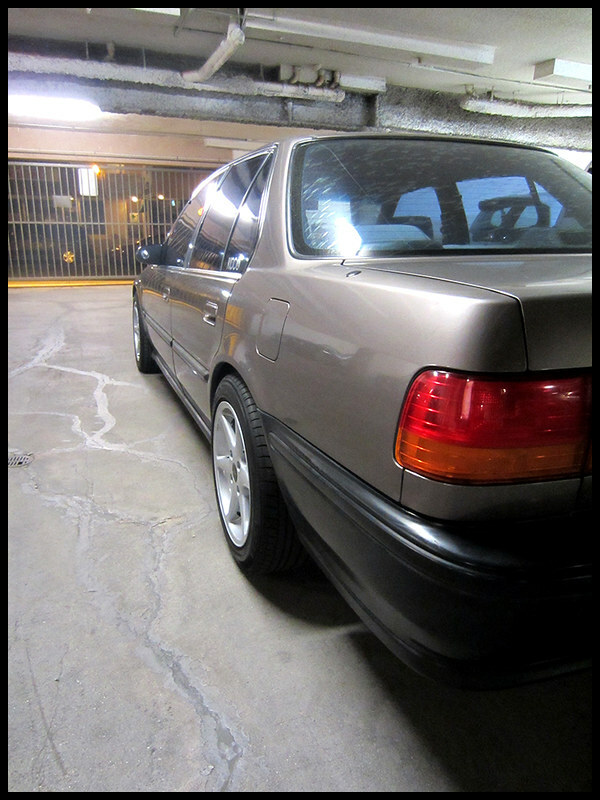 It is OG paint except for the driver's fender (I bought it that way), but it has its share of battle scars. It photographs well, but in person you can see it needs some TLC. If you look at the angle shot, you can see the fender has a fresher rose tone than the rest of it. The age of the paint is definitely showing. I just keep it as clean as I can! I'm a sucker for meaty tires. The car looks great! 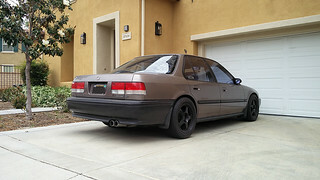 I like the subtle mods; the stuff any Accord owner could appreciate but others might overlook. It's a nice build overall. Gotta have the meaty tires to fill the huge wheel wells we have on these things. I was able to run 215/50/16 with out any issues, great ride and handling too. I've always run 205/50/16 since I sized up... Never thought to run 215's. 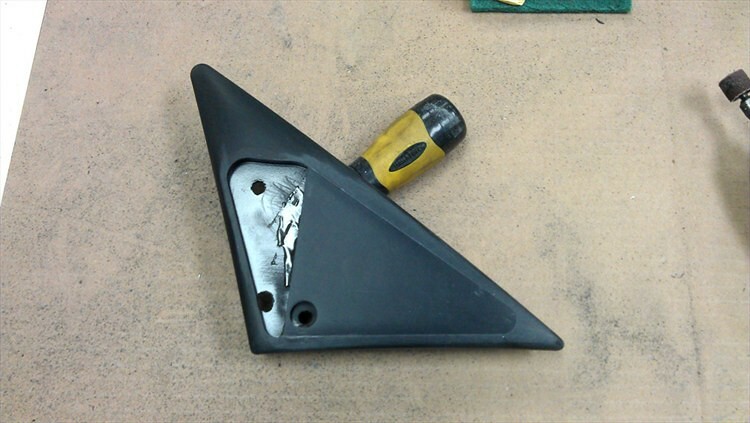 Maybe after my Ecsta PA31's wear out, I'll look into switching up the width. 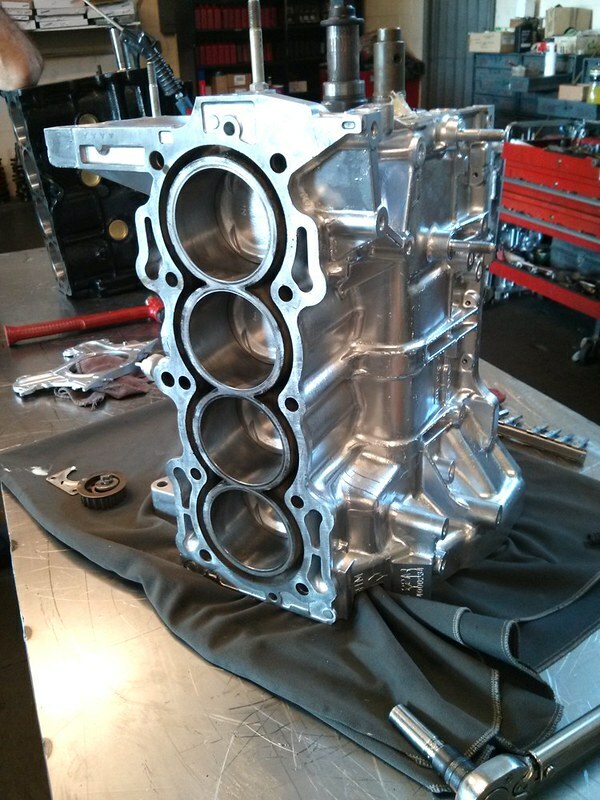 Excellent progress, I'm very jealous of you California guys and no rust issues. 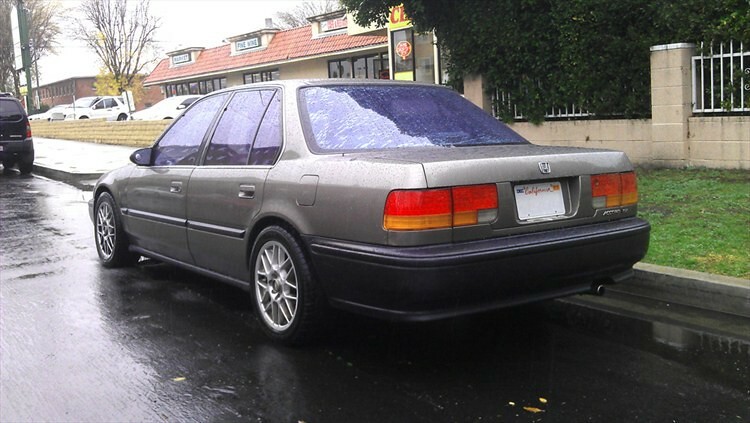 A 92/93 DX or 96/97 Wagon is what I'm on the lookout for as a shell candidate to swap all my good stuff over to, the current chassis is getting to the point of too much rust. September 2015 - Took advantage of the Pick Your Part Labor Day 50% weekend. 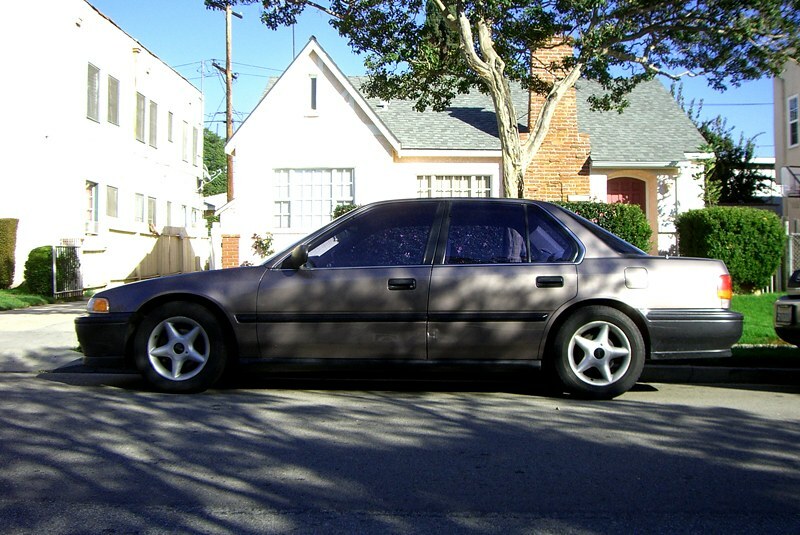 Found a super clean 93 LX in Rosewood Brown Metallic and took what I could from it. 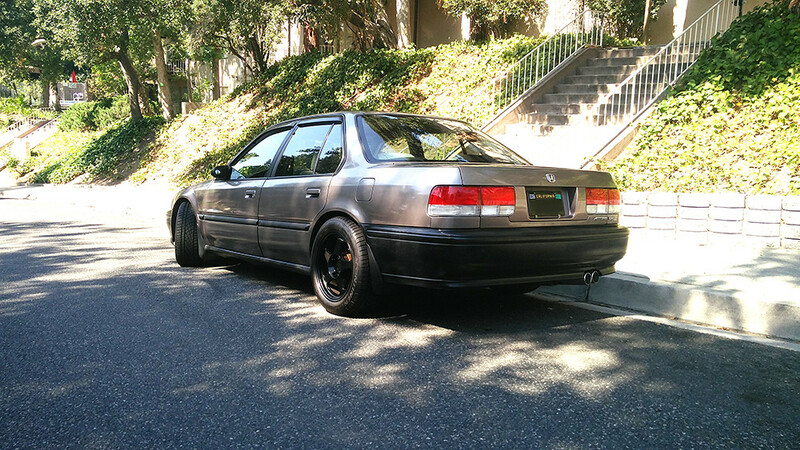 Got the tail lights, rear corner trims, license plate bracket, driver's side front fender, mud flaps and the rear lower control arms (for future poly bushing installation). 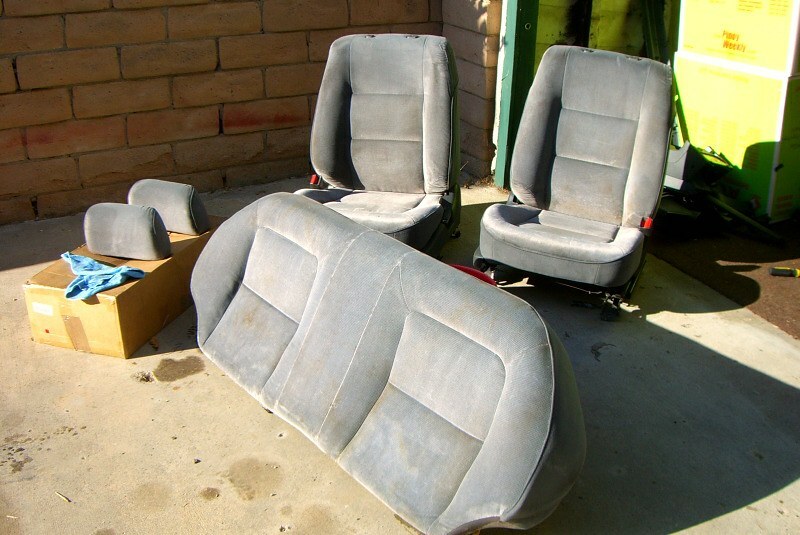 Found a gray interior CB7 that had all four floor mats in it... took those! Finally, found a wagon and snatched up the trunk organizer! 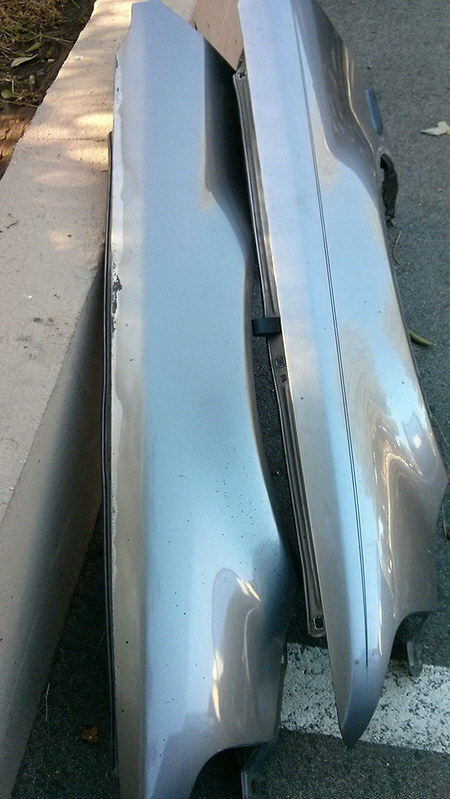 Old fender (left) had a bad ding up top and the paint just chipped away. 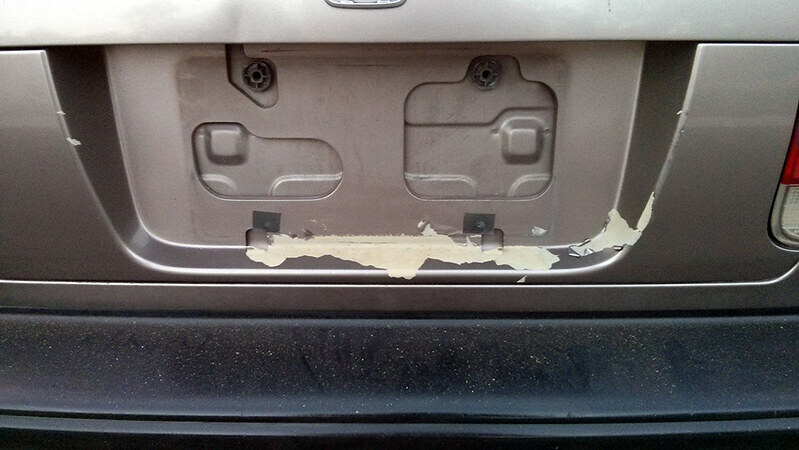 Previous owner broke off the license plate tabs. They took some of the paint with them. All clean! 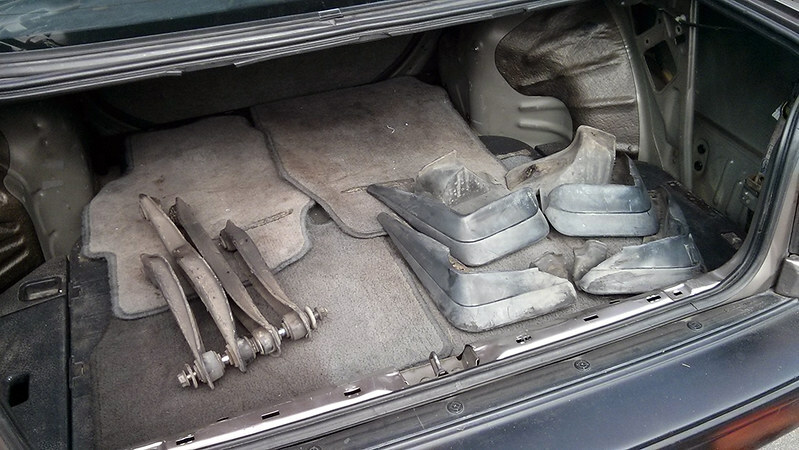 Unfortunately the trunk lid on the donor car was used as a tabletop for a valve cover (looked like a B series cover) and was badly dented and scratched, otherwise I would have taken the whole trunk. @Chrisnick rust is definitely no good. Only thing I have to worry about in California is sun damage to the paint and other car owners. All of the scratches, dings and dents on my car are others' faults from parking too close, hitting my car with their doors or walking too closely along side it with things like keys or bags of sharp objects swaying about and last, but not least, lack of general parking ability. 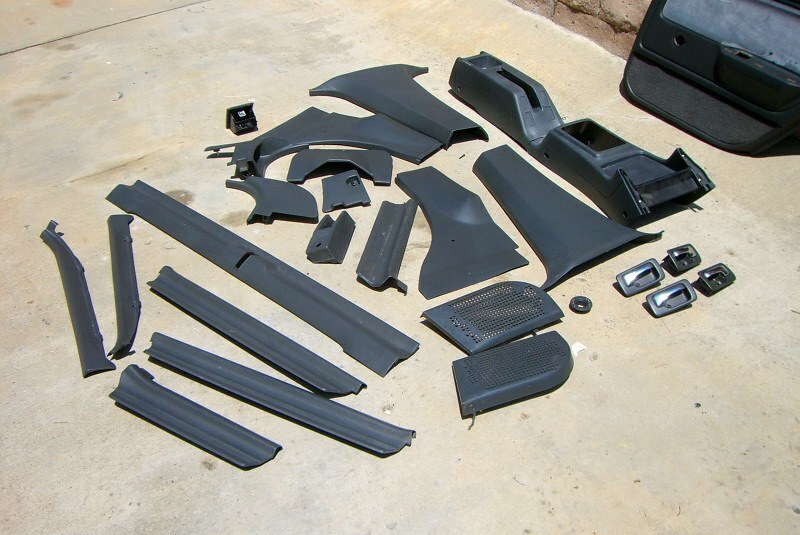 Good luck finding a recipient for all of those parts you've got! 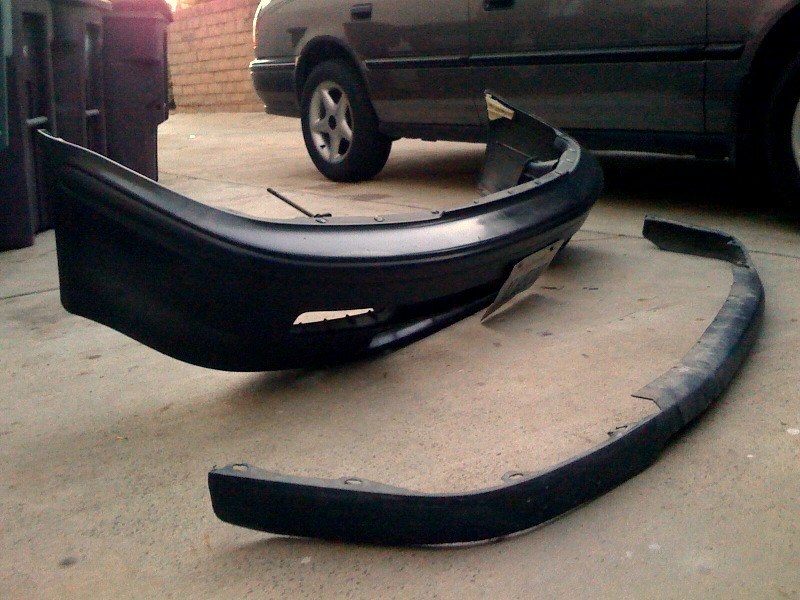 Just Plasti-Dip the entire chassis/body for extra protection lol! 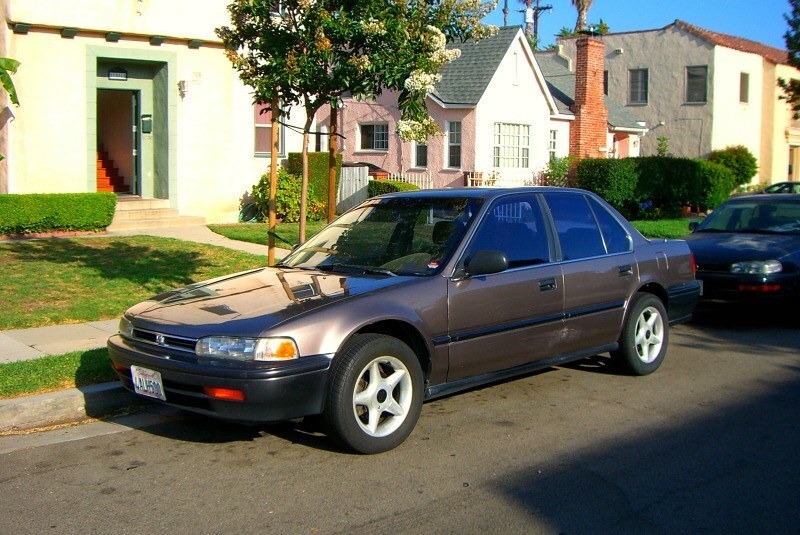 The more I look at this car, the less I like the mirrors. Everything else just seems top-notch. 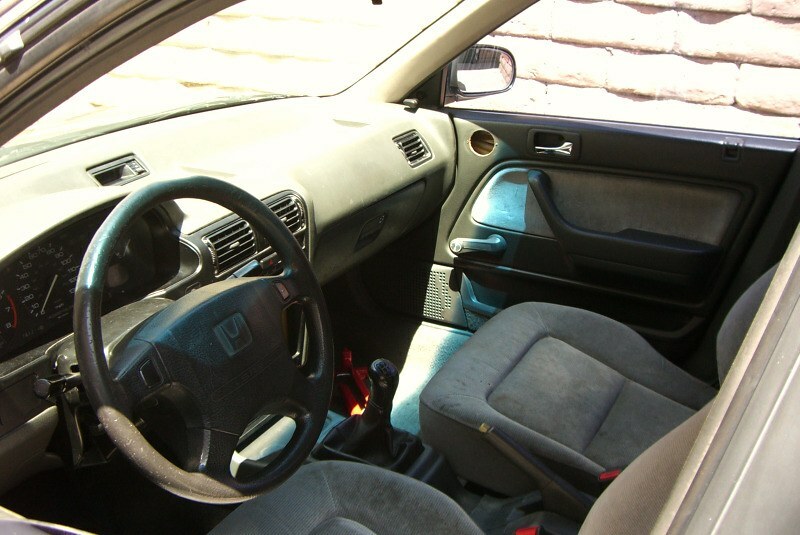 You pay attention to the areas of your car that need just a little work and you address them. To use a "sum of all its parts" analogy, you're correcting even the small things like paint imperfections behind the license plate. While in and of itself it may not be a large issue, it contributes to the overall state of imperfection. 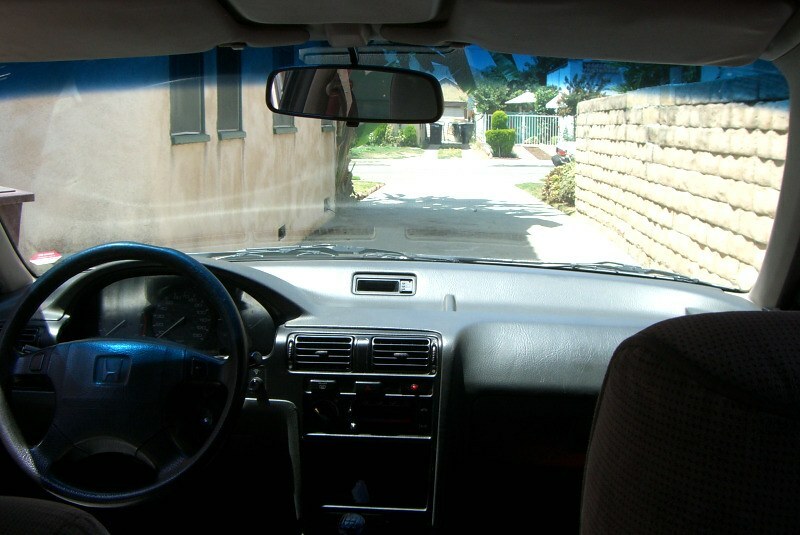 By tackling these small issues, the whole car begins to step closer and closer to that "perfect" ideal. While achieving that with a 22 year-old car may not be realistic, you're still doing an awfully fine job with few resources spent. Keep up the great work! @Jarrett Thank you! I'm just doing my best to keep it clean and running. 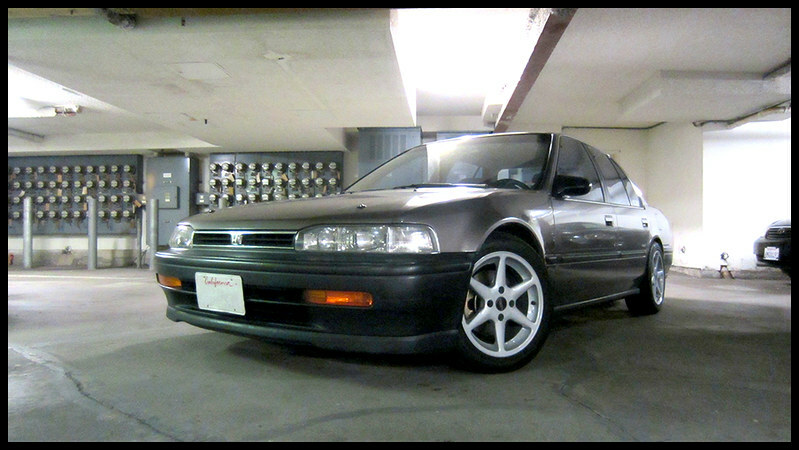 One of these days I'll get the body cleaned up and resprayed (OEM color). The mirrors are definitely a hit and miss with people. A friend of mine only recently got to like them because of the Rota Slipstreams... but he then proceeded to advise me to paint my car Phoenix Yellow and Spoon Blue. 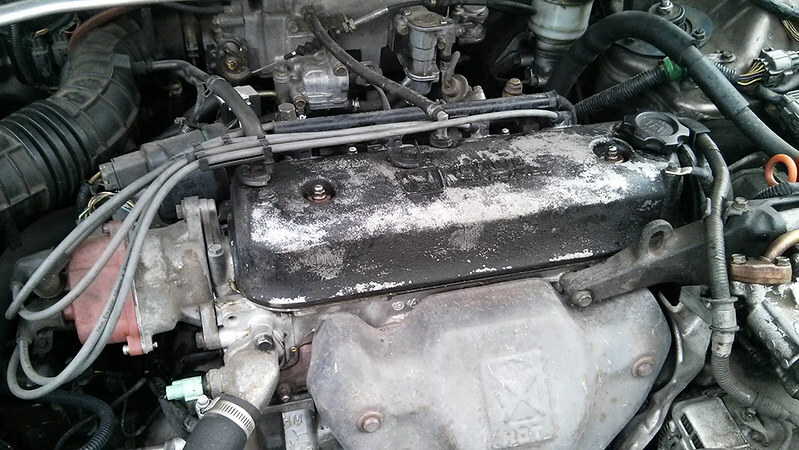 September 2015 - Oil in the spark plugs... not good! 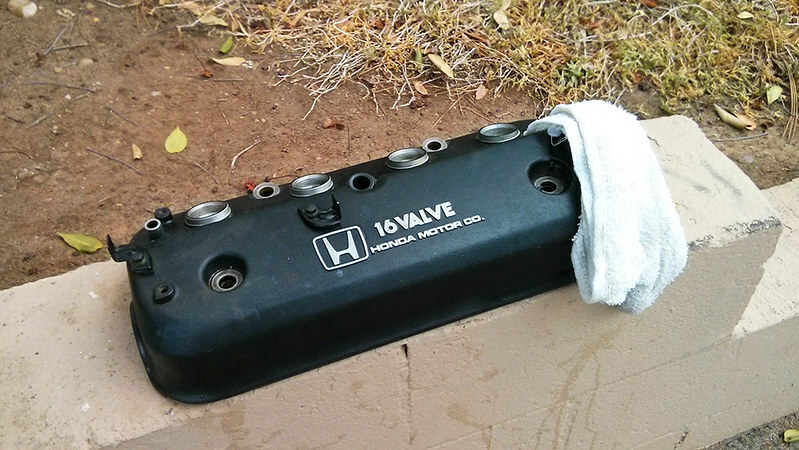 Visited Pick Your Part and bought a replacement valve cover for my engine. The paint used on the existing cover has not held up to the job and I didn't have time to strip and respray it. 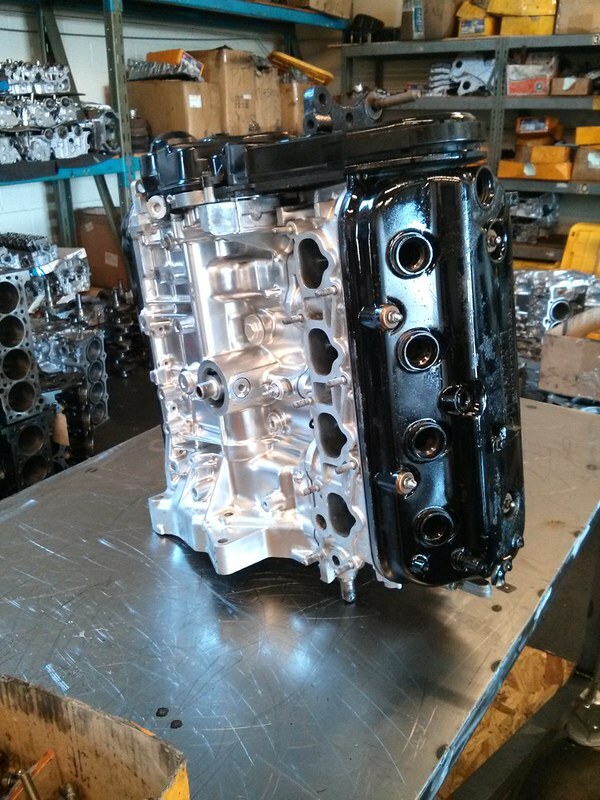 I had initially done a complete distributor seal replacement because the inner seal had worn out, allowing oil to enter the housing. Oil and heat are definitely not good for wire insulation. In swapping out those seals, I severed or shorted some of the electrical connections inside, because the wires' insulators had simply crumbled to bits. 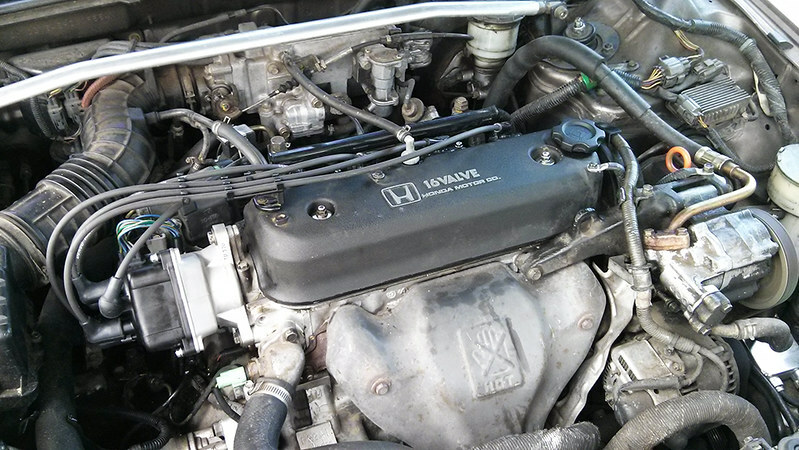 ECU was throwing a code 4 (crank position sensor error). Had to buy a new distributor. I like where you are going with this DX. Keep up the great and fast work! Love this thread man. Keep it up. 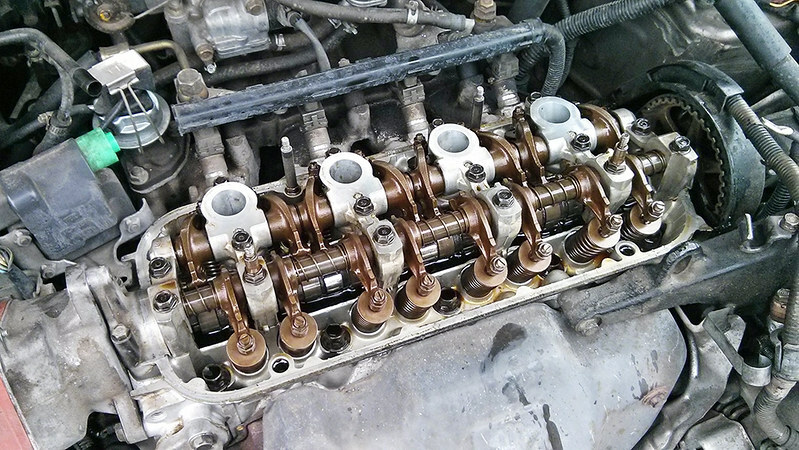 What differences have you noticed taking care of valve adjustment/seals, etc?